The Mayor and councillors held a strategic planning day on 30 November 2016 with a programme that covered key challenges and opportunities for the triennium, the values Council wished to work by, and objectives for what needed to be achieved during this term of Council. 4.1 Jean-Paul Pochin and Yasmeen Maria - Extinction Rebellion. 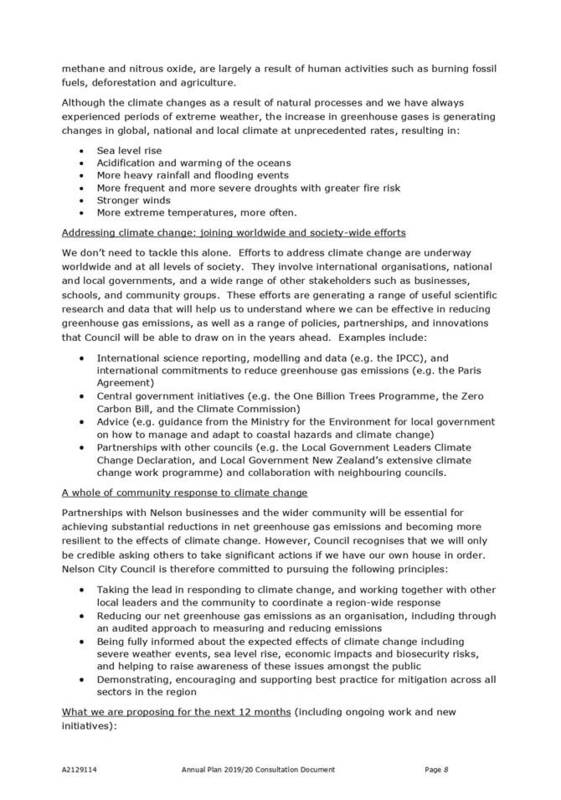 Introduction of the Extinction Rebellion movement and urging faster action to climate change. 1. Confirms the minutes of the meeting of the Council, held on 19 February 2019, as a true and correct record. Agrees that the applicants pay all costs, including legal, valuation and survey, associated with the road stopping and sales process. Approves the amendment of Schedule A of the Urban Environments Bylaw No.225 to include the Kerr Street Walkway area (refer map A2120387) in the list of Alcohol Ban Areas – 24 Hours, 7 days a week. Approves the continuation of pet cremation services at the Wakapuaka Crematorium, noting that if the pet cremation is not fully user pays, then an adjustment to fees will be made to the fee schedule to achieve this outcome. Adopts the Heritage Activity Management Plan 2018 – 2028 (A1826798) to reflect the approved Long Term Plan 2018 - 2028. Adopts the Arts Activity Management Plan 2018 – 2028 (A1766400) to reflect the approved Long Term Plan 2018 - 2028. 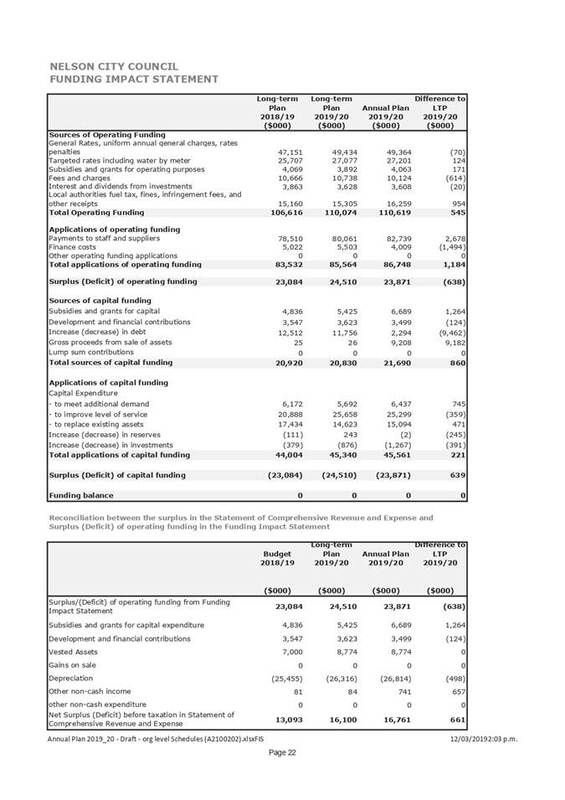 Agrees that the residual community investment funding 2019/20 (up to $41,393) be combined with the existing small grant pool of $50,000 for 2019/20. 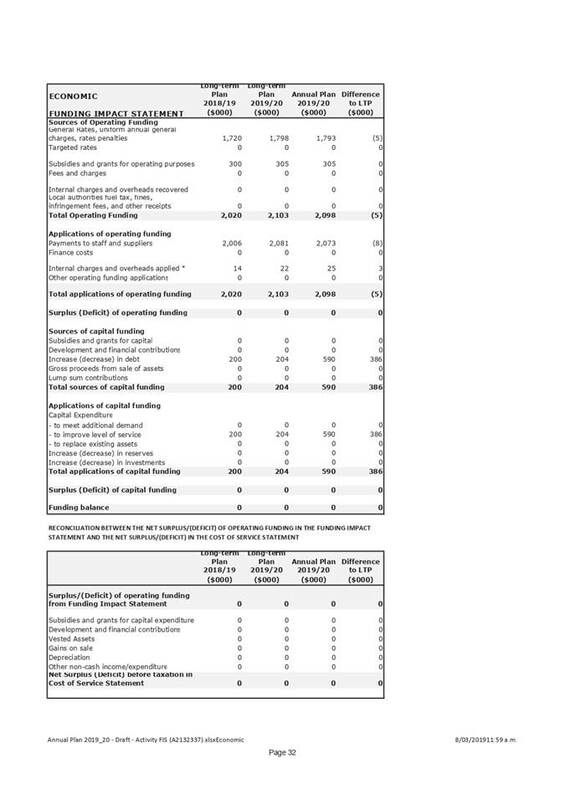 Approves the updated Community Investment Fund Panel Terms of Reference (A2093465) and Code of Conduct (A1960223). 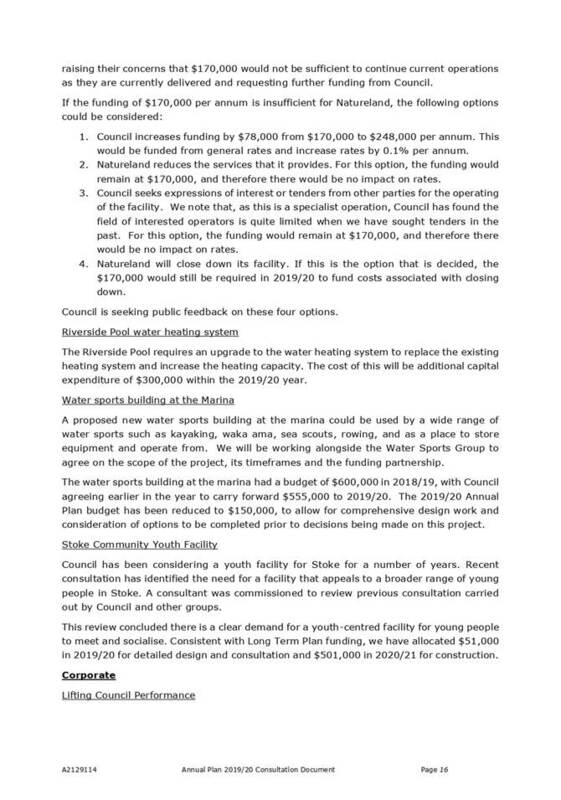 Confirms the Nelson Regional Development Agency’s review of Board performance will be completed by 1 November 2019. 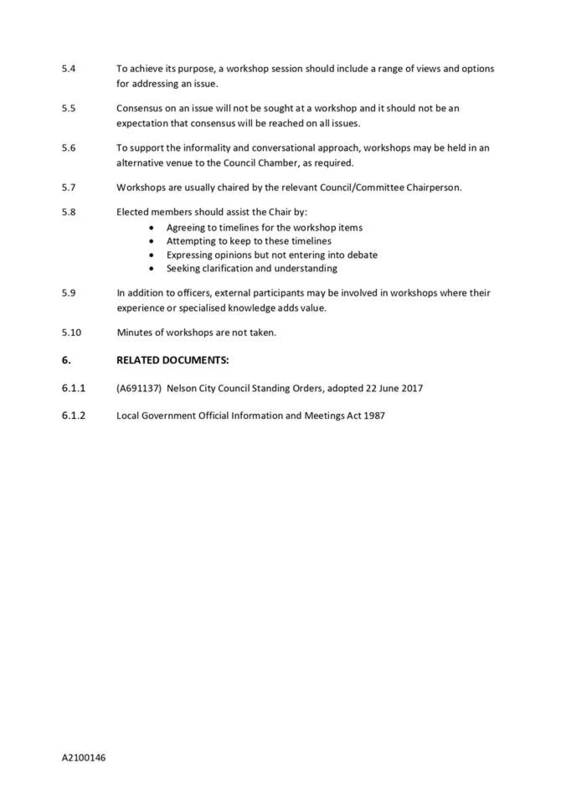 Note: The recommendation to Council at the Governance Committee meeting on 26 July 2018 was taken in parts and the following paragraph in bold was mis-recorded as a resolution of the Committee, therefore was not included in the recommendation to Council. 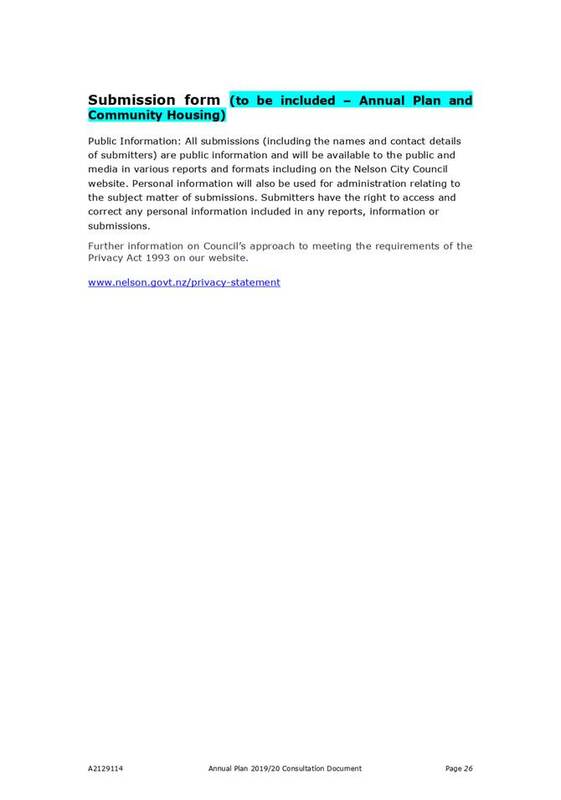 The full recommendation, which was resolved at the Council meeting on 9 August 2018, is below for your information. The paragraph in bold is the remaining recommendation, the full recommendation has been included for your reference. 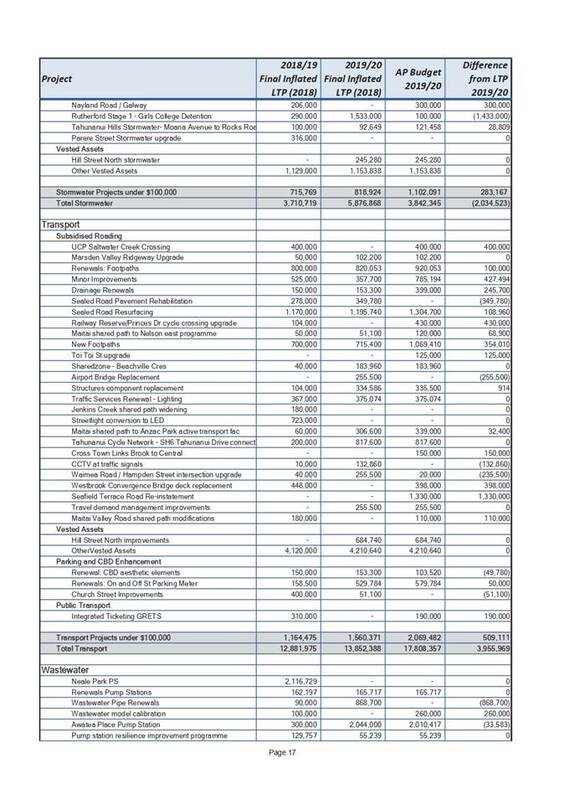 Approves unbudgeted expenditure of $20,000 for the All Blacks vs Argentina Rugby Match including provision for Park and Ride associated with the Match. 1. Receives the report Mayor's Report (R10042) and its attachment (A2149760). Roger Nicholson, Chair of Nelson Civic Trust will be in attendance to present on the City of Nelson Civic Trust activities. (c) will result in the Consultation Document being as widely publicised as is reasonably practicable as a basis for consultation. 2. Adopts the Council Workshop Policy (A2100146). 1. 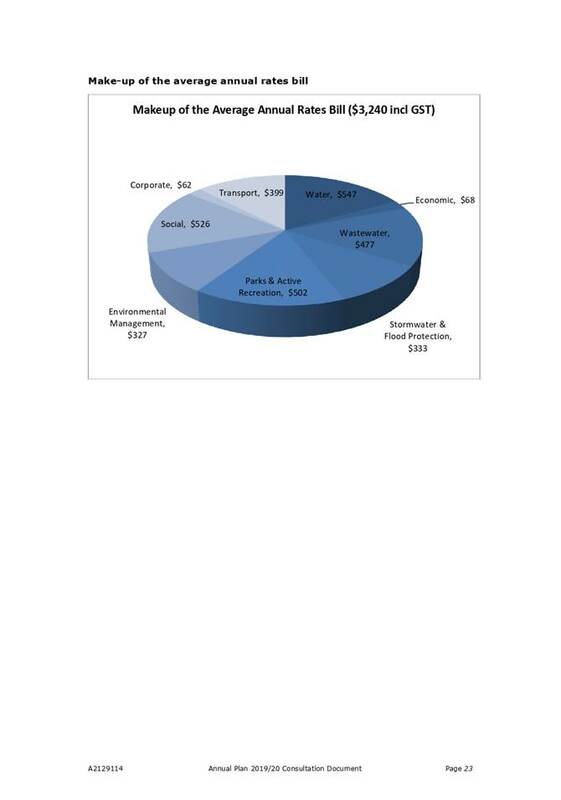 Confirms, in accordance with sections 48(5) and 48(6) of the Local Government Official Information and Meetings Act 1987, that John Murray for Item 2.2.1 and Paul Sheldon for Item 3 remain after the public has been excluded, for Items on the Public Excluded agenda (Campground Governance and Tahunanui Campground, and Decision Report on the Tasman-Nelson Regional Pest Management Plan), as they have knowledge relating to the Items that will assist the meeting. 1. Excludes the public from the following parts of the proceddings of this meeting. That the exclusion of the public from the whole or the relevant part of the proceedings of the meeting is necessary to enable the local authority to deliberate in private on its decision or recommendation in any proceedings to which this paragraph applies. c) Any proceedings of a local authority in relation to any application or objection under the Marine Farming Act 1971. Councillor Tim Skinner gave the opening prayer. 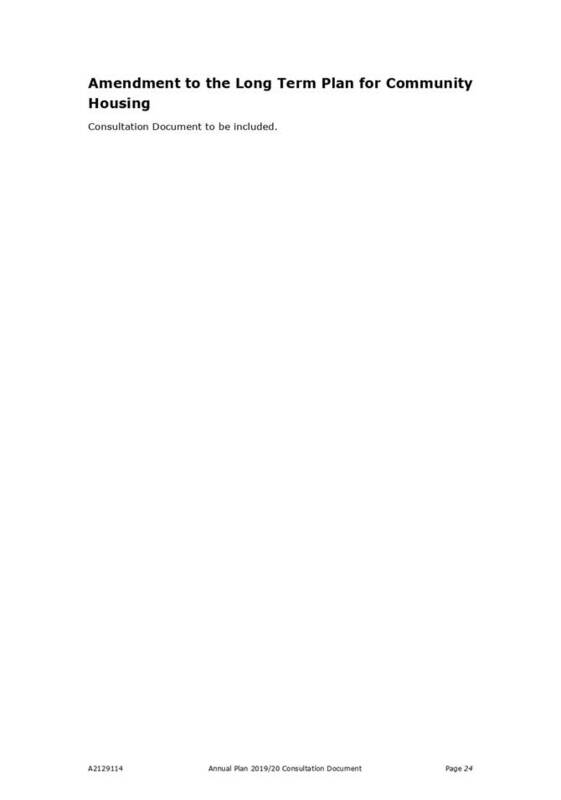 Document number M3990, agenda pages 5 - 29 refer. Amended minutes of the 13 December 2018 Council meeting were tabled. Confirms the amended minutes of the meeting of the Council, held on 13 December 2018, as a true and correct record. Her Worship the Mayor provided a verbal report in which she spoke about the emergency situation in the Nelson Tasman region, the Nelson Griffins’ Invercargill win and the upcoming kapa haka competitions leading up to the 2025 Te Matatini Festival. The Mayor advised that updates on the water supply/drought situation and on the Waimea Road traffic lights would follow the Council meeting. The meeting went into public excluded session at 9.20a.m. and resumed in public session at 10.33a.m. There being no further business the meeting ended at 10.33a.m. 1.1 To update Council on current topics. 3.1 In 2017 and 2018 many councillors attended the Local Government New Zealand Conference in Auckland and Christchurch. In 2019 the conference is to be held in Wellington from 7 to 9 July, the theme is ‘Riding the localism wave: Putting communities in charge’. 3.2 Registrations for the conference are now open. Councillors who are interested in attending are requested to make their intentions known to the Manager, Governance and Support Services as soon as possible, so that bookings can be made. 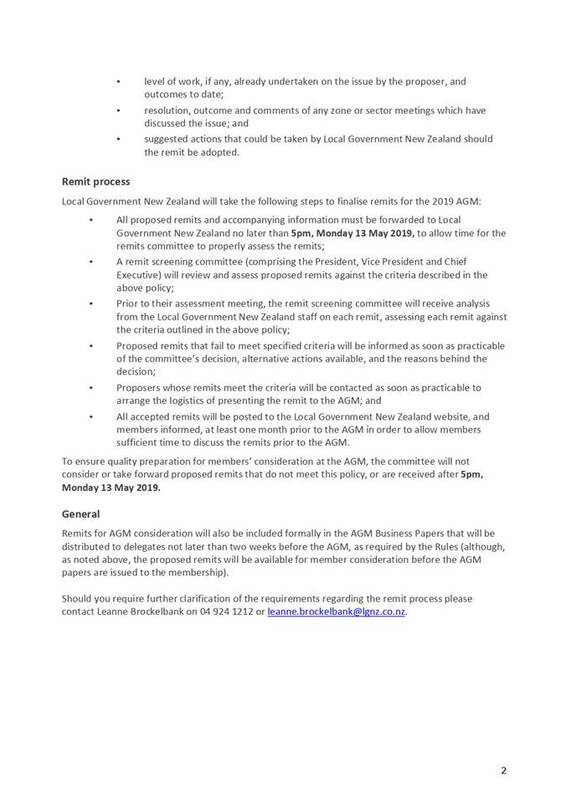 4.1 The Local Government New Zealand (LGNZ) Annual General Meeting (AGM) is being held on Sunday 7 July 2019, in Wellington as part of the LGNZ Conference. 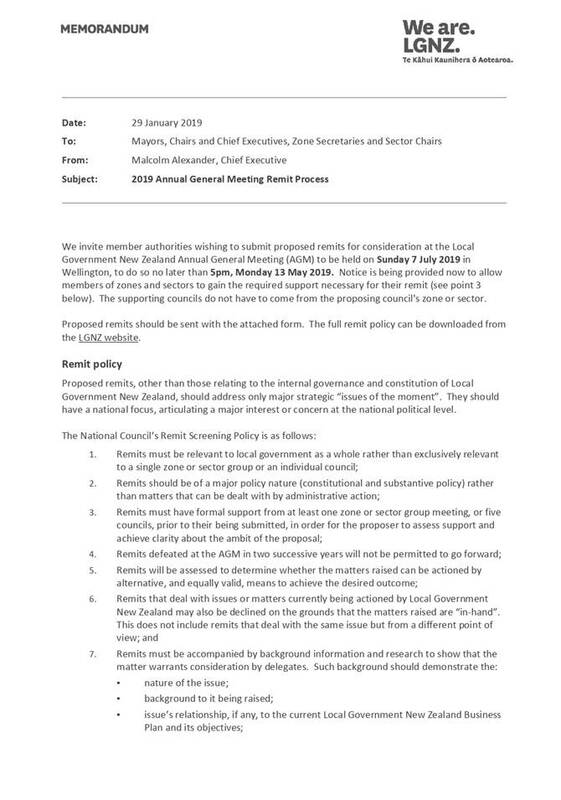 4.2 LGNZ has invited member authorities wishing to submit proposed remits for consideration at the LGNZ AGM, to do so no later than 5.00pm, Monday 13 May 2019. 4.3 A copy of the memo and application form received from LGNZ outlining the remit process is provided as Attachment 1 (A2149760). 4.4 Councillors are requested to approach the Office of the Mayor for assistance in preparing any remits. 5.1 The Mayor donated $500.00 to the Nelson Youth Theatre Company from the Mayoral Discretionary Fund. Nelson Youth Theatre Company performed at Nelson’s Christmas Celebration lunch for senior citizens hosted by the Mayor and also stepped in as waiting staff to help serve lunch to the guests. 5.2 The group have four musicals planned in April, including Chicago and the New Zealand premiere of "Ghost the Musical", which will be their 200th show. In July they are staging the "The Lion King JR" and then take “Grease” on tour to the Edinburgh Fringe Festival in August with a group of 27 actors and 10 support crew. In October they will stage two more musicals in Nelson during the school holidays. 1.1 To adopt the supporting information on which the Consultation Document for the Annual Plan 2019/20 and proposed amendment to Long Term Plan 2018-28 is based and to adopt the Consultation Document for the Annual Plan in principle. 2.1 Council is required to prepare and adopt an Annual Plan for each financial year. 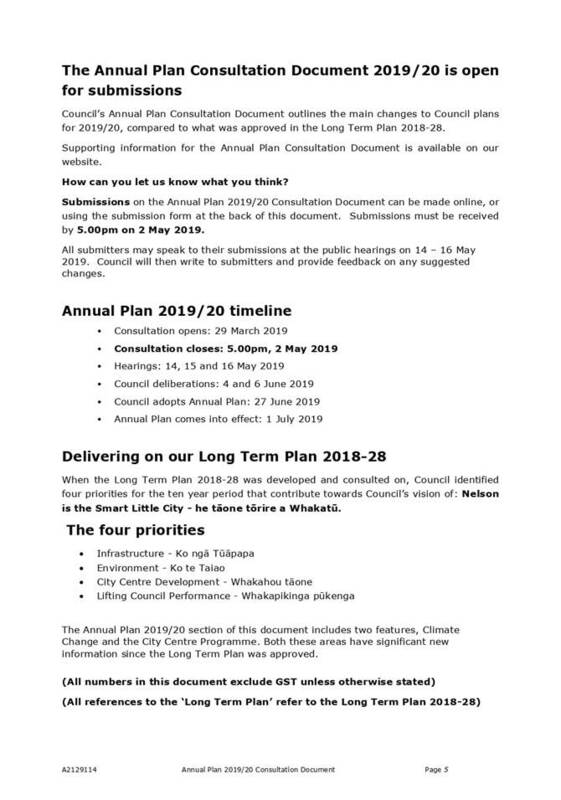 A Consultation Document must be prepared as the basis for consultation with the community where there are “significant or material differences between the proposed annual plan and the content of the long-term plan for the financial year to which the annual plan relates”. 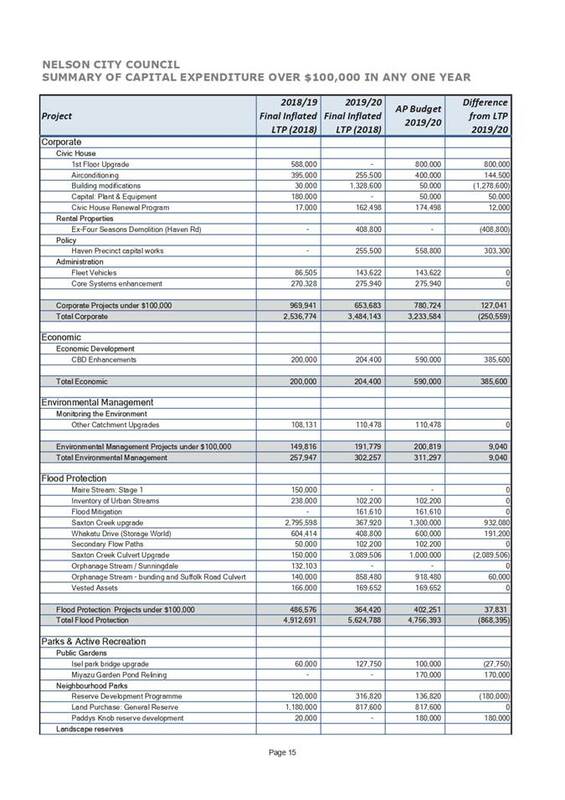 2.2 The rates rise proposed in the Consultation Document for the Annual Plan (Consultation Document) is 4.2% and the proposed debt at the end of June 2021 is $96.7m. 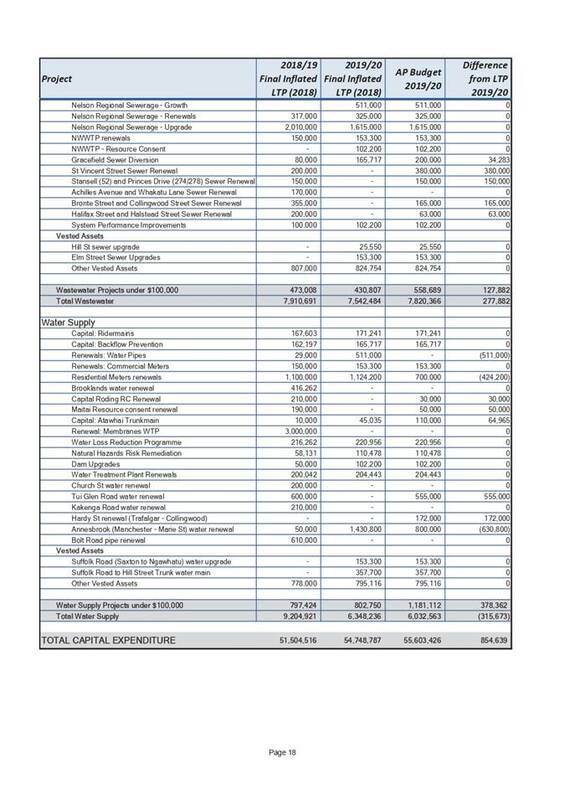 The respective figures for 2019/20 in the Long Term Plan 2018 – 28 (LTP) were a rates rise of 3.9% and debt of $121.5m. 2.3 A proposal in relation to Council’s community housing will be brought to Council on 27 March 2019. The details included in the Consultation Document in relation to the community housing proposal are subject to Council’s decision and the final adoption of the Consultation Document on that date. 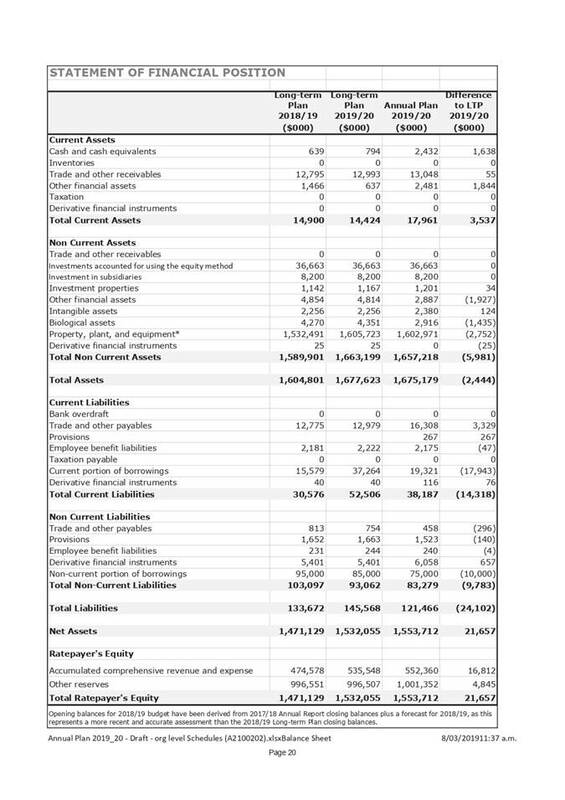 4.1 The Annual Plan 2019/20 is an exceptions document. It presents changes to the 2019/20 work programme from what was outlined in the LTP. 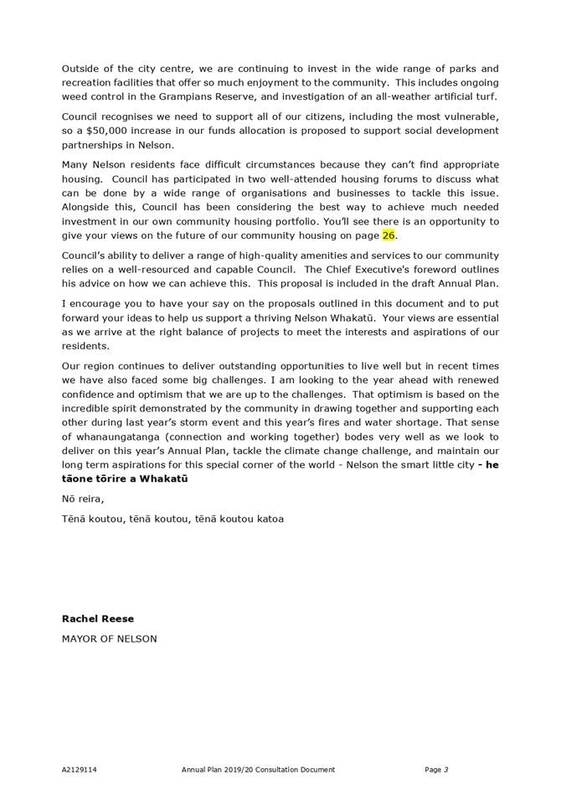 4.2 On 27 March 2019, Council will be requested to adopt for consultation a proposal to divest its community housing. 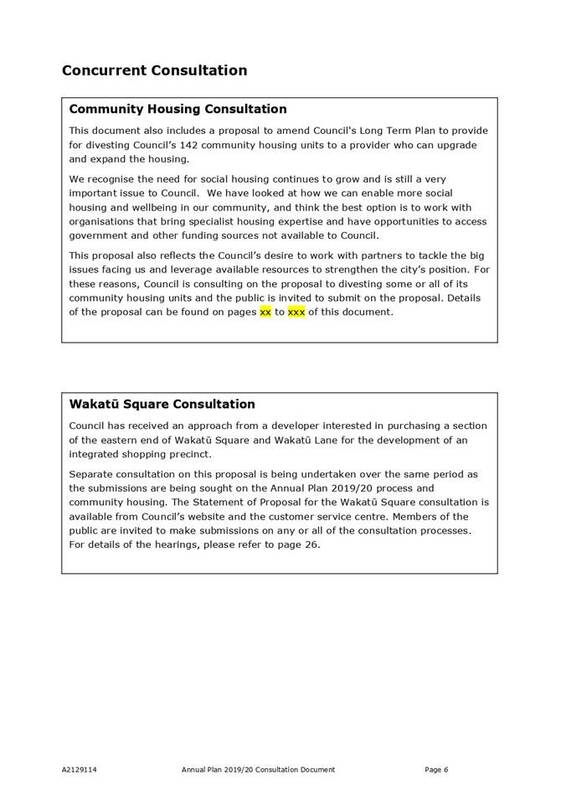 As community housing is a strategic asset in Council’s Significance and Engagement Policy, if adopted the proposal to divest triggers an LTP amendment process. Consultation on the amendment to the LTP will be combined with the consultation on the Annual Plan. 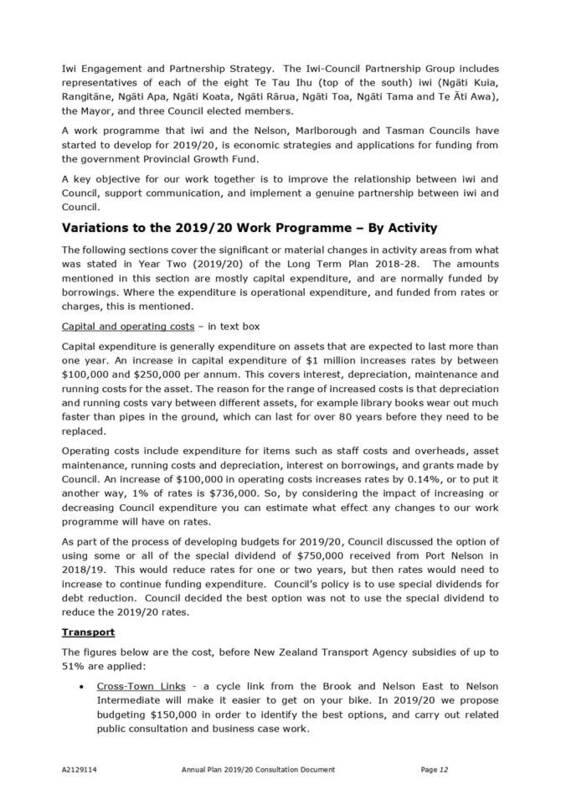 4.3 At workshops in December 2018 and February 2019 Council considered a range of items and projects which are different in timing, scope or cost, to those included in year two of the LTP. 4.4 Section 41A of the Local Government Act 2002 (LGA) describes the role of the Mayor in leading the development of the Annual Plan and officers have worked with the Mayor to develop a work programme that takes into account guidance from the workshops, as well as fiscal and resourcing constraints. Key changes from the LTP are included in the Consultation Document, and the supporting information that was relied on to prepare this document and the proposed LTP amendment is Attachment 2 (A2152430). 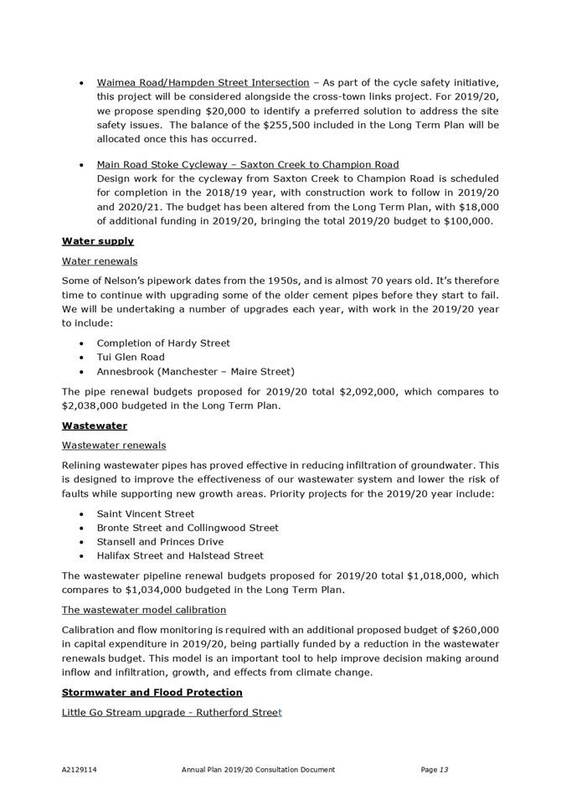 4.5 Most of the changes proposed for year two of the LTP are to support the four priorities set by Council for the ten year period: Infrastructure, Environment, CBD Development, and Lifting Council Performance. 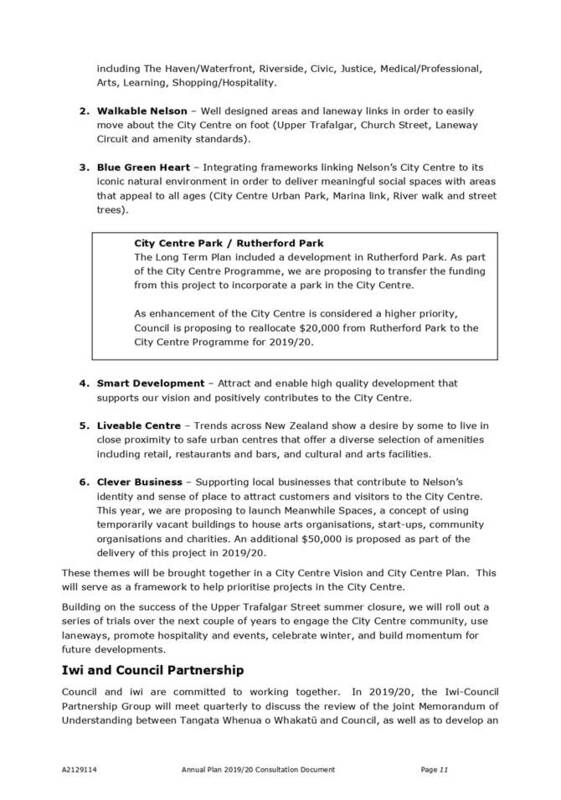 These priorities contribute towards Council’s vision of ‘Nelson is the Smart Little City - he tāone tōrire a Whakatū’. 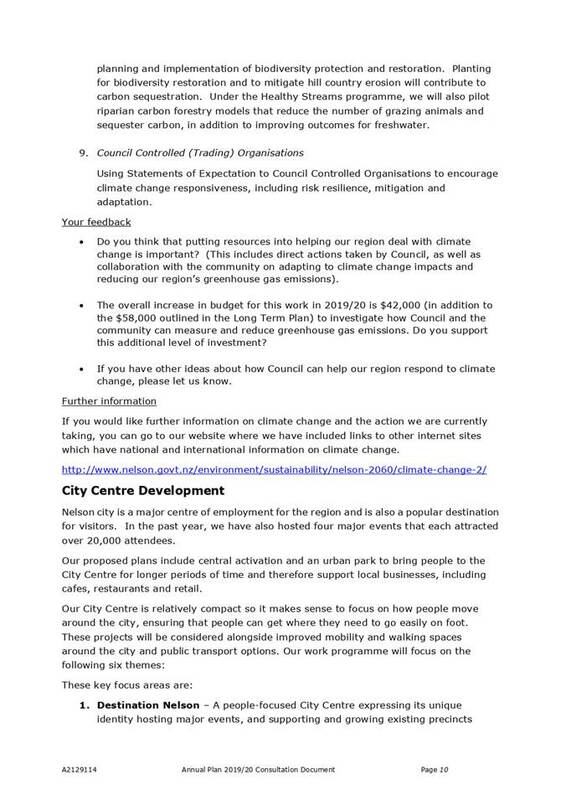 From these priorities three issues: climate change, the city centre plan and lifting Council performance, have been highlighted in the Consultation Document as areas of particular focus in 2019/20. 4.6 Some of the projects scheduled for the 2019/20 year have had changes in timing which will see them commence in later years. There are a range of reasons for these adjustments, for example to allow more efficient scheduling of projects. Re-prioritisation of low priority projects is sometimes required to ensure higher priority projects can be completed on time. The February Pigeon Valley and area fires required significant resources from both Nelson and Tasman Councils, and is likely to also contribute to project delays. These projects, and their appropriate timing, will be reconsidered if necessary as part of the 2020/21 Annual Plan process. 4.7 Section 95A(2)(b) of the LGA requires Council to “outline the expected consequences” of proceeding with the changes to the relevant year of the LTP, including the implications for the local authority’s Financial Strategy in a consultation document. 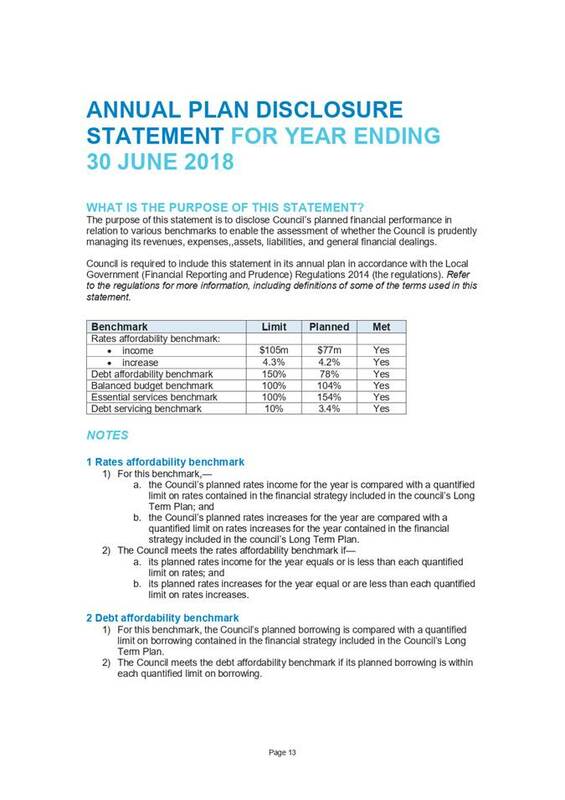 4.8 A key priority for Council is to keep within the rating and loan limits that were set as part of last year’s Long Term Plan and Financial Strategy. For 2019/20 this includes keeping the rates increase, including an allowance for growth, at or below 4.3%, and the debt to revenue ratio below 105.1%. 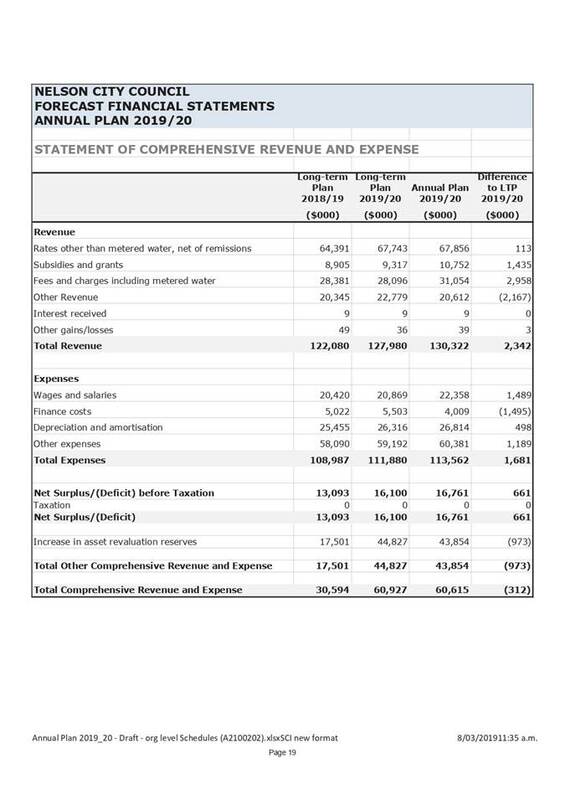 4.9 The changes to the work programme for 2019/20 still enable Council to achieve these objectives, with the proposed rates increase being 4.2% and debt to revenue ratio being 78%, compared to 105% in the LTP. 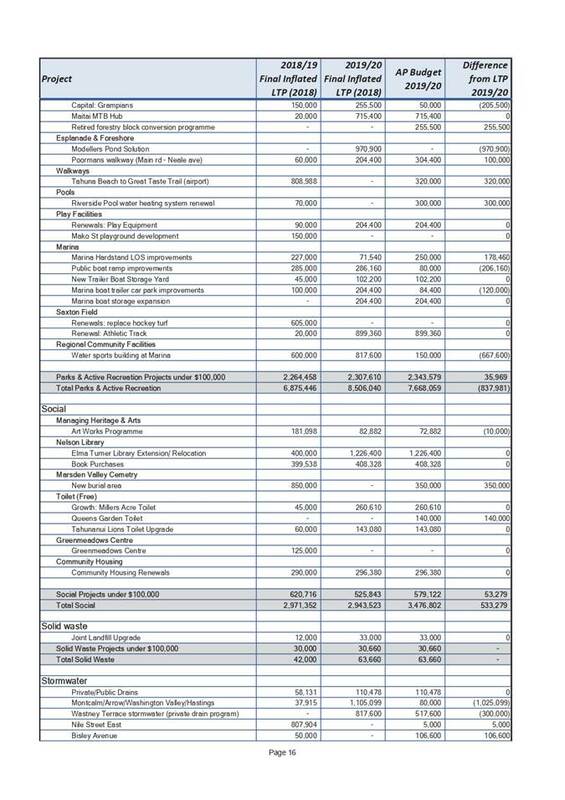 4.10 Overall operating expenditure is forecast to be $113.6 million in 2019/20, compared to $111.9 million in the LTP, and the capital expenditure is forecast to be $46.8 million, compared to $46m for 2019/20 included in LTP. 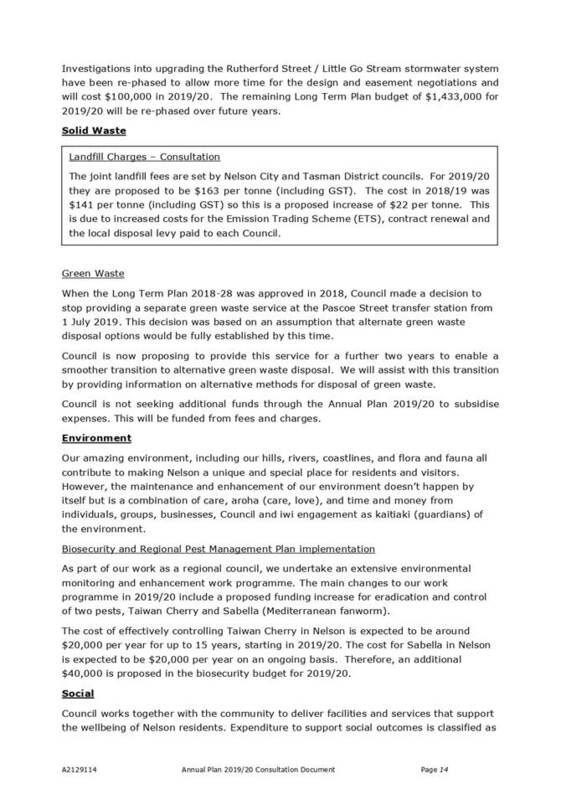 4.11 Ceasing provision of a separated green waste service at the Pascoe Street transfer station from 1 July 2019 was previously decided through the Solid Waste Asset Management Plan 2018-28 process and there was an intention to withdraw this service from 1 July 2019. This decision was based on an assumption that members of the public would be fully aware of alternate green waste disposal options and that commercial compost operations would be well established. 4.12 Officers believe the public need more time to adapt, and a continued effort is required to promote drop off directly to the alternate green waste processors. Ceasing reception of separated green waste prematurely risks excessive amounts being directed to landfill. 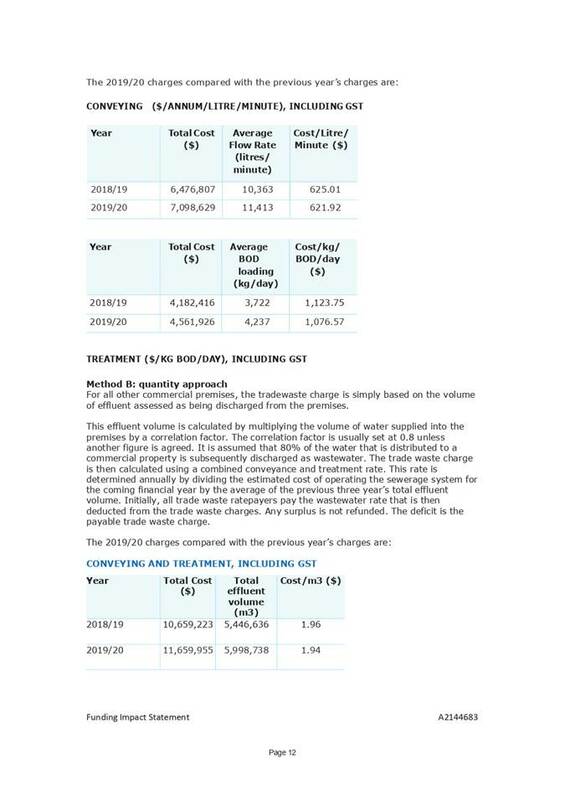 Costs incurred are recovered from green waste gate charges at Pascoe Street transfer station and can be increased further to promote and incentivise direct drop off at processors. Officers are therefore recommending that the LTP 2018-28 decision be rescinded and reviewed again as part of the next Long Term Plan process. 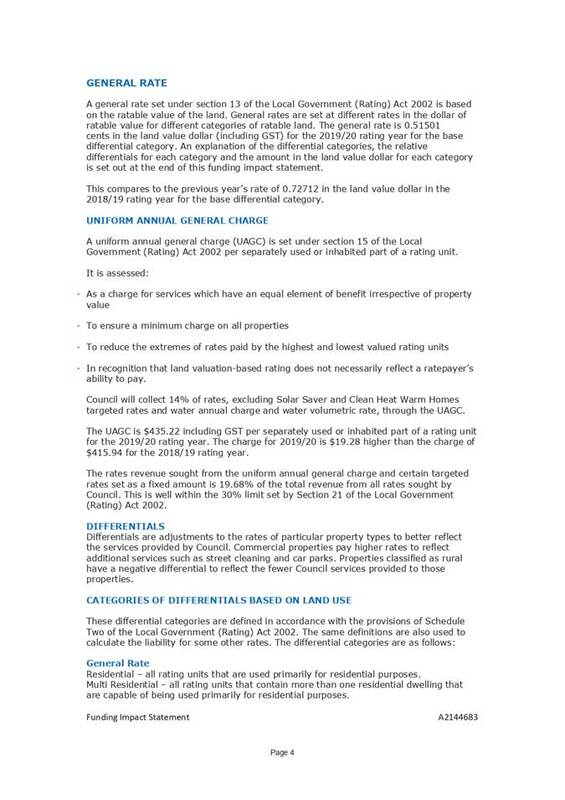 4.13 The three yearly revaluation of properties was undertaken on behalf of Council as at 1 September 2018 by Quotable Value Limited. 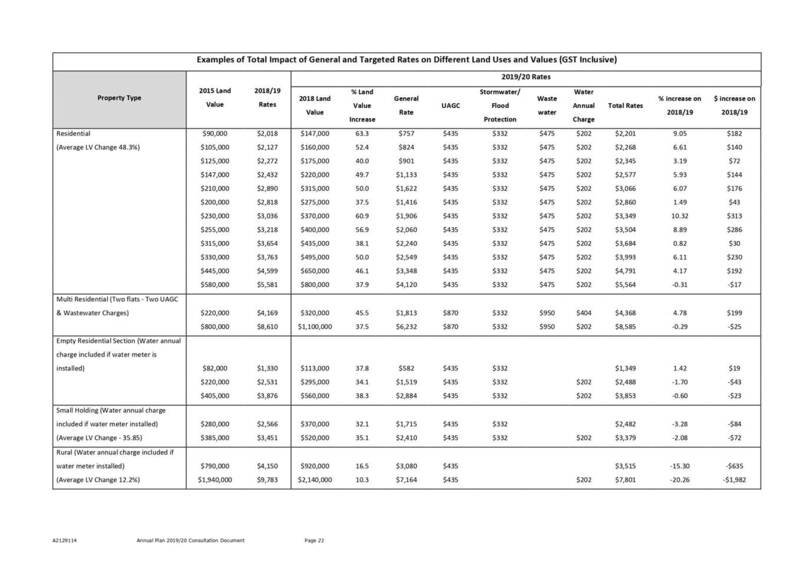 The main changes since the 2015 revaluation were that residential property values increased significantly, lifestyle and commercial properties also increased (but to a lesser degree than residential property). 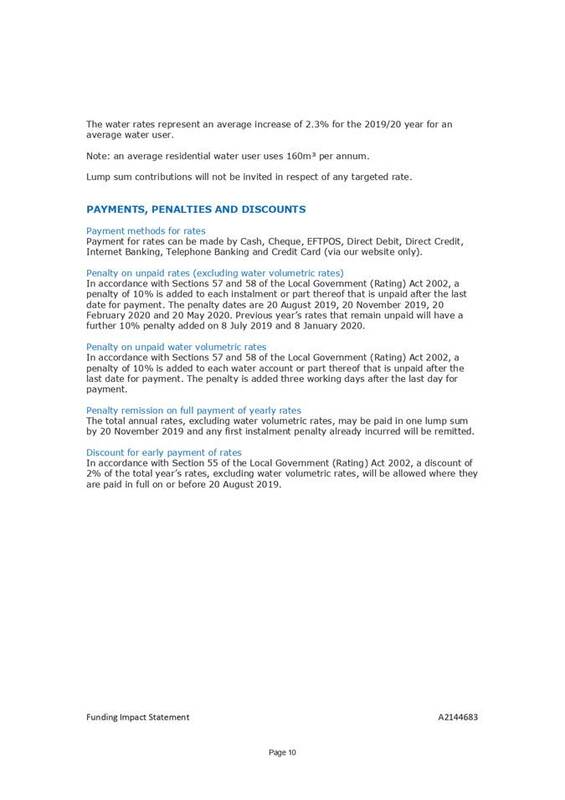 4.14 The new values will be used as the basis for assessing rates from 1 July 2019. 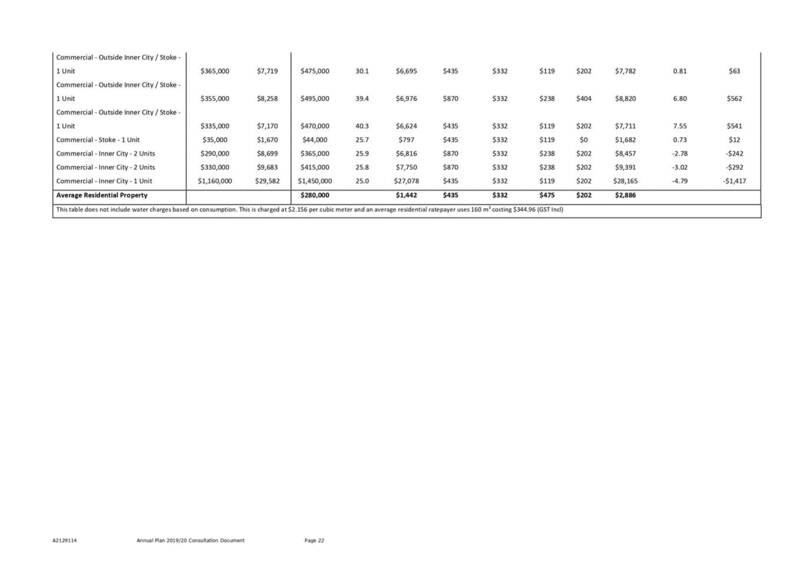 The revaluation does not generate any additional revenue for the Council. Rather, the updated base means rates will be spread between ratepayers in different proportions than they were previously. 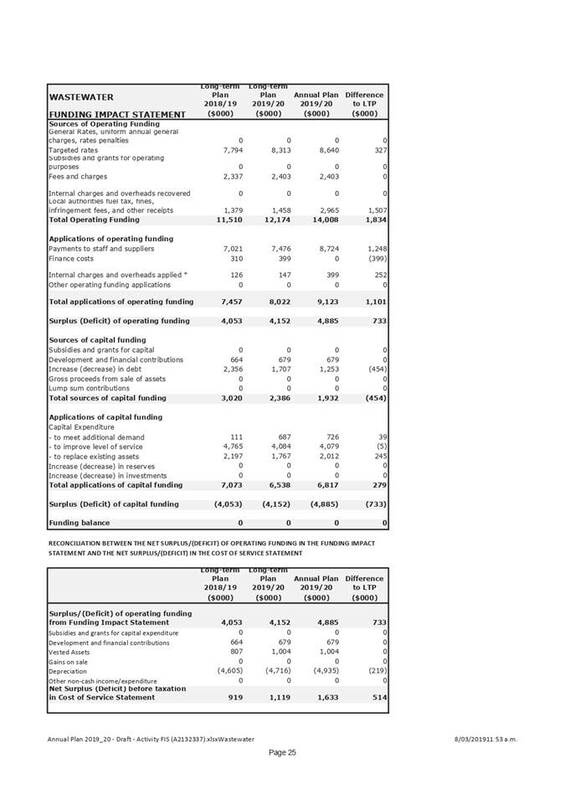 4.15 Generally if the land value for a property has increased by more than the average for the city, the rates on that property will increase by more than the average. 4.16 The commercial differential recognises the additional services that businesses receive, such as extra rubbish collection, street sweeping, and events to attract visitors. 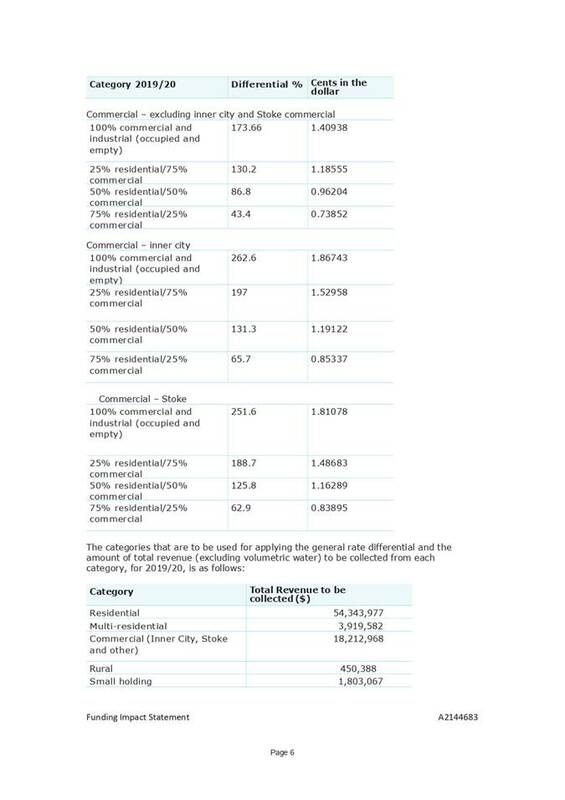 4.17 In 2018/19 Council collected 24.6% of rates from commercial properties. 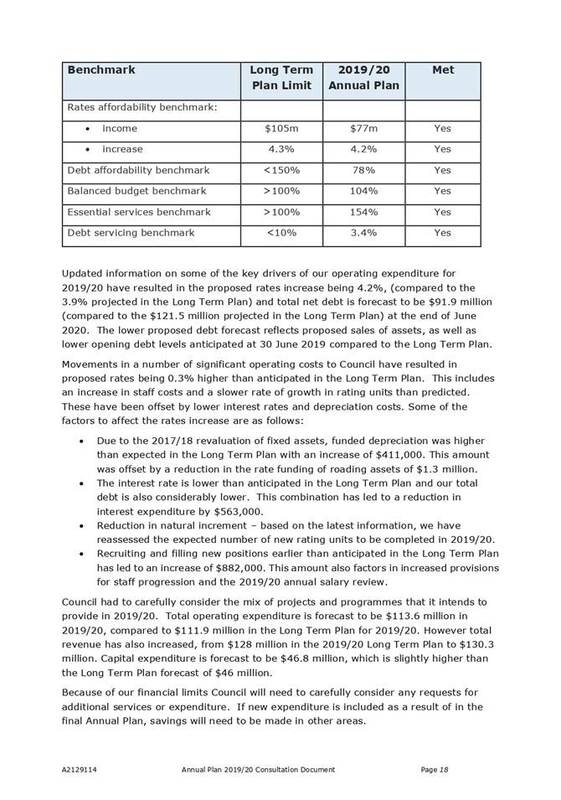 In the LTP, Council consulted on reducing the commercial differential by 0.5% each year for five years, subject to annual review. 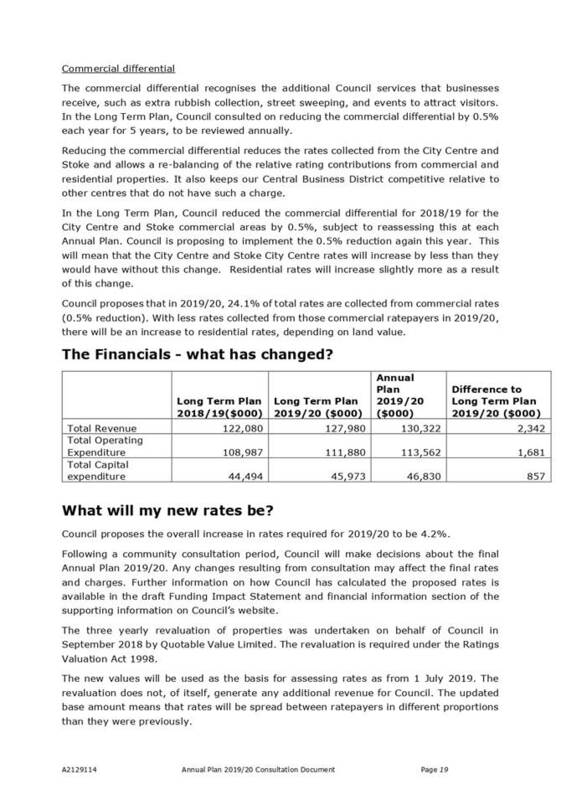 4.18 In the LTP, Council reduced the commercial differential for 2018/19 for the City Centre and Stoke commercial areas by 0.5%. 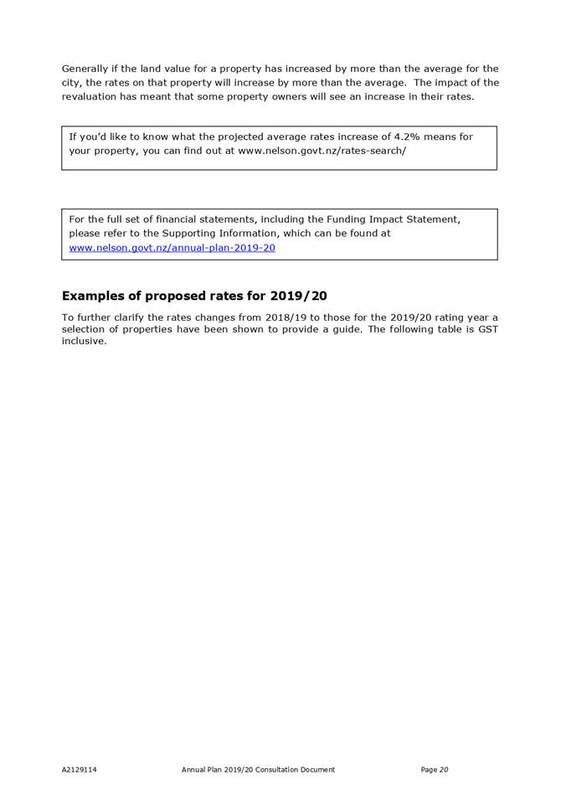 The Consultation Document proposes a further reduction of 0.5% in 2019/20. This will mean that the City Centre and Stoke rates will increase by less than they would have without this change. 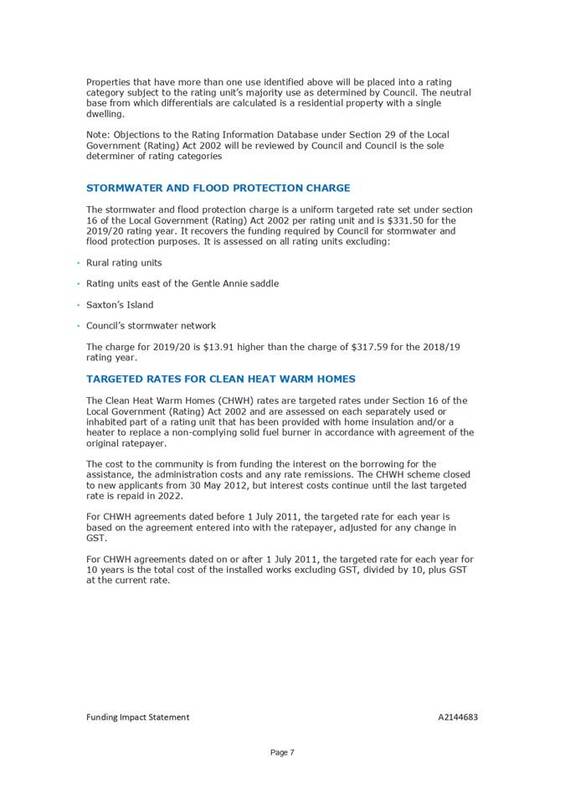 Residential rates will increase slightly more as a result of this change. 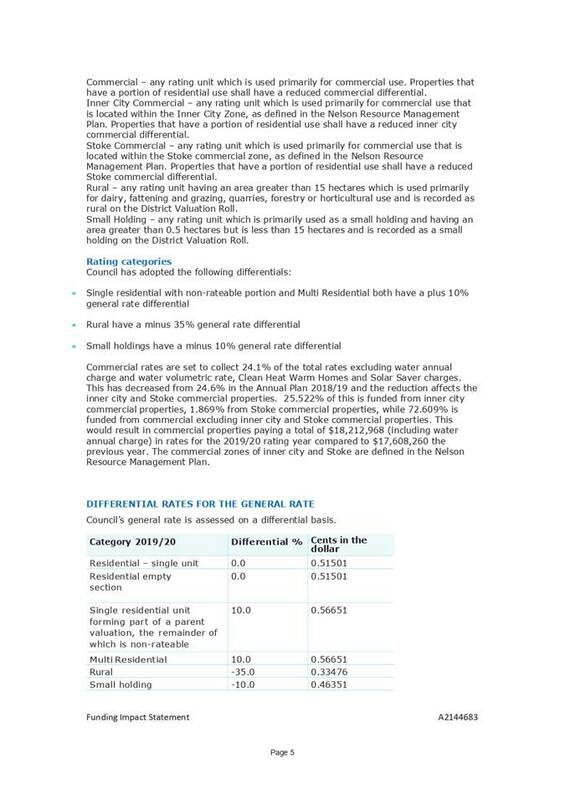 4.19 Reducing the commercial differential allows a re-balancing of the relative rating contributions from commercial and residential properties. It also keeps our city centre competitive with other centres that do not have such a charge. 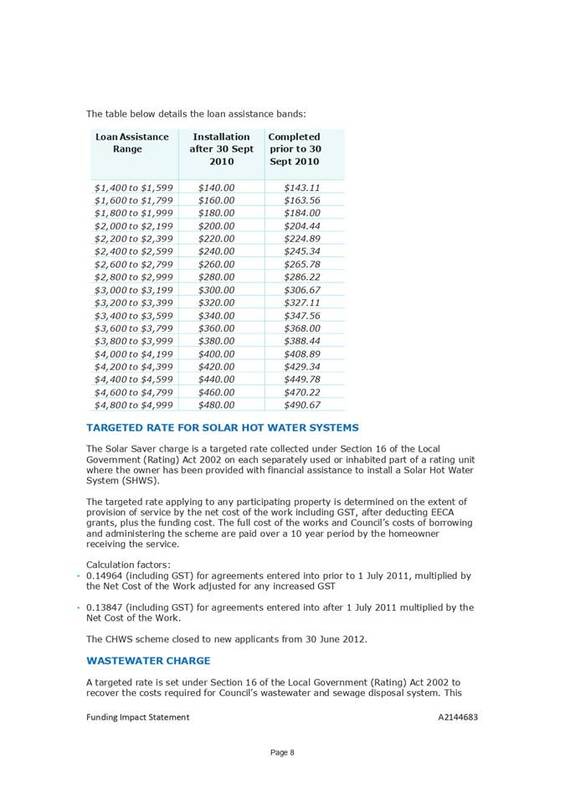 4.20 The impact of this would be less collected from those commercial ratepayers in 2019/20, with a small increase to other ratepayers. 4.21 With the establishment of a joint landfill business unit, landfill fees are now consulted on through the annual plan or LTP processes. 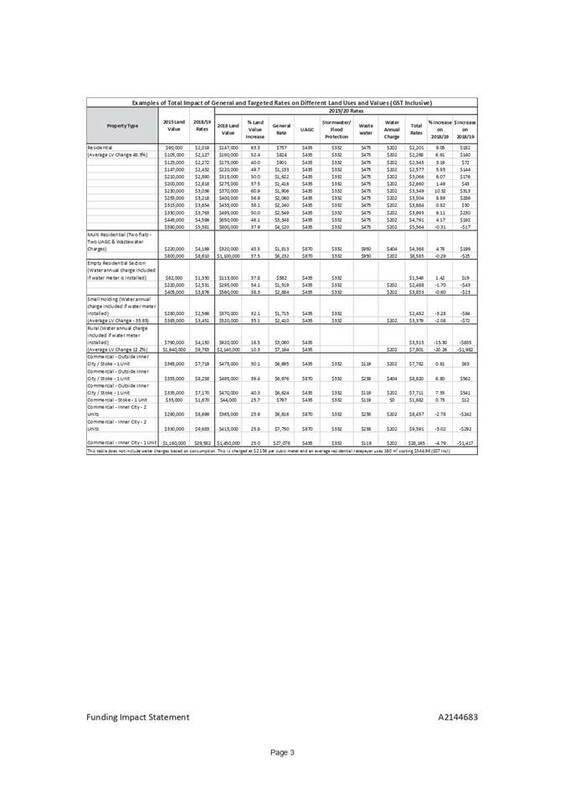 For 2019/20 they are proposed to be $163 per tonne (including GST). 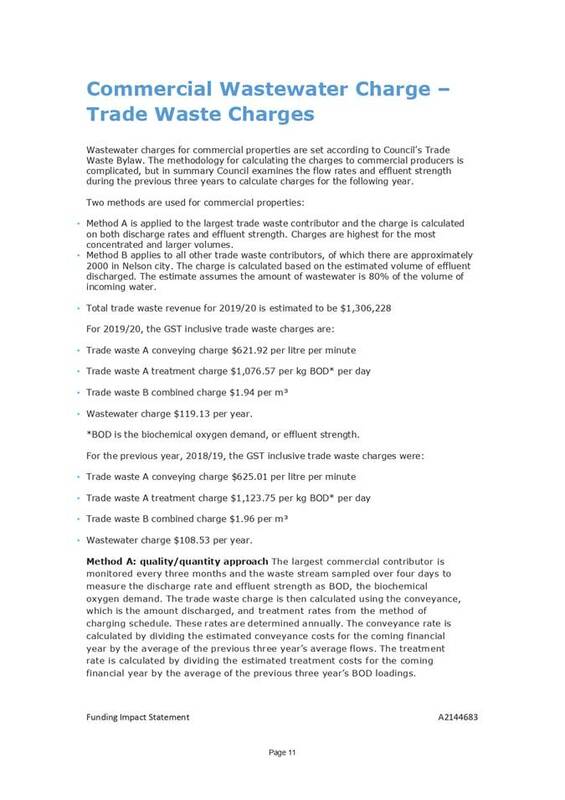 The cost in 2018/19 was $141 per tonne (including GST) so this is a proposed increase of $22 per tonne. This is due to increased costs for the Emission Trading Scheme (ETS), contract renewal and the local disposal levy paid to each Council. 4.22 It is proposed that the Consultation Document includes a proposal to divest Council’s 142 community housing units. However, this is subject to the Council decision about the proposal which will be made on 27 March 2019. 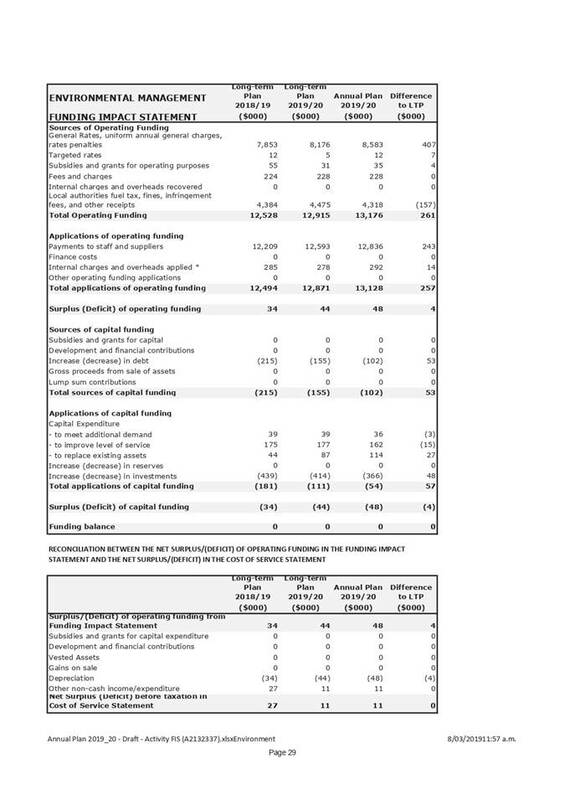 4.23 The supporting information relied on by the content of the Consultation Document for the Annual Plan 2019/20 is based on the assumption that the proposal to divest Council’s community housing will be adopted for consultation by Council on 27 March 2019. 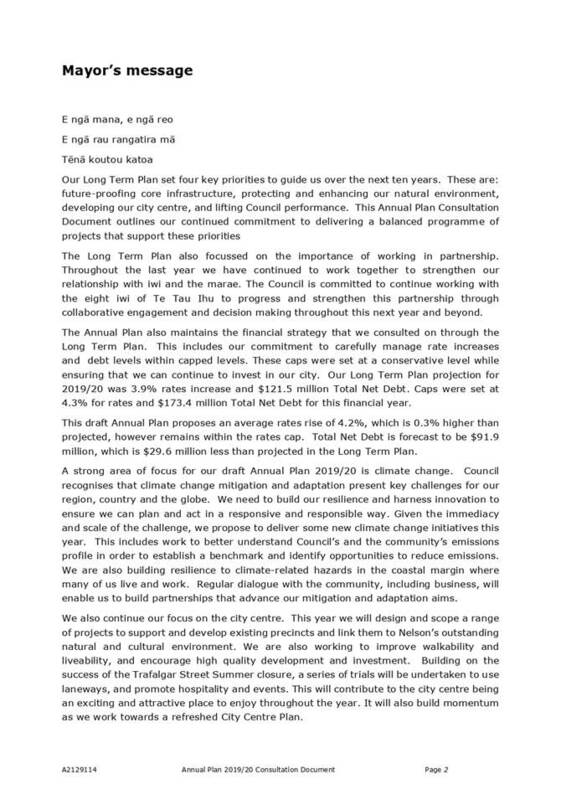 4.24 Section 95 of the LGA requires Council to “prepare and adopt an annual plan for each financial year” and, unless there are no “significant or material differences”, consult on a consultation document which contains the main differences between the relevant year of the LTP and the proposed annual plan. 4.25 Section 95A(3)(b)(i) of the LGA states that the consultation document must not contain or have attached to it a draft of the annual plan as proposed to be adopted. However, section 95A(3)(c) requires Council to state where the “public may obtain the information held by the local authority that is relied on by the content of the consultation document, including by providing links or references to the relevant information on an internet site maintained by or on behalf of the local authority”. 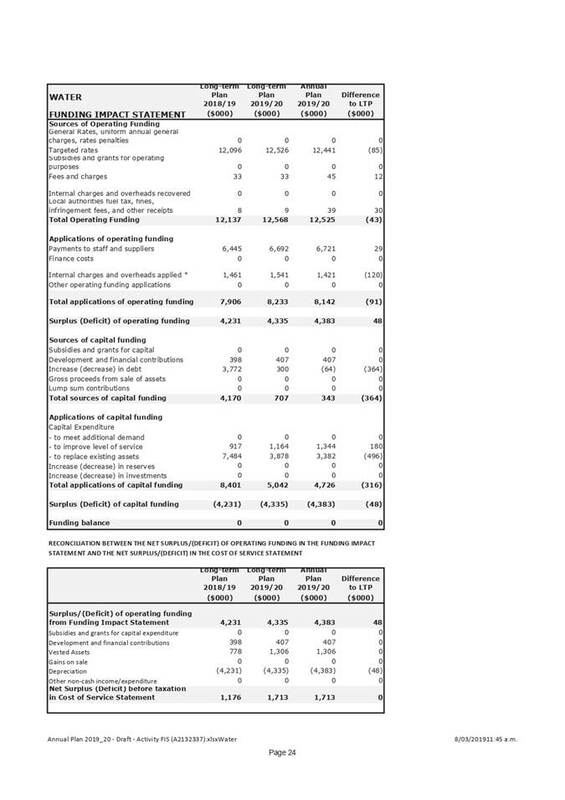 Attachment two (A2152430) provides the financial information that supports this requirement. · A special edition of Our Nelson to be delivered to households. This is the main means of publicising the Consultation Document. · Hard copies of the Consultation Document to be available from the Customer Services Centre and Council libraries. The Consultation Document and supporting information will also be available on the Council website. 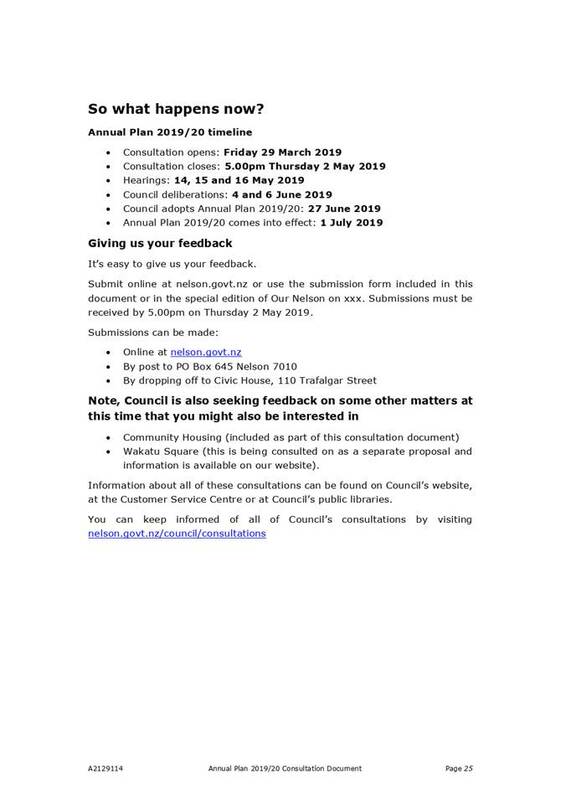 · Opportunities will be provided for the public to discuss the Consultation Document with councillors and staff, for example stalls at the Saturday market and Isel Night market. · Copies of the Consultation Document are available for councillors to take to any community meetings that they attend during the consultation period. · Advertisements will be placed in local newspapers. 4.27 Social media and media releases about the Annual Plan and community housing consultation will also be used to publicise the consultation. 5.1 Council can adopt the attached supporting information and adopt in principle the Consultation Document for consultation. Alternatively, Council can make changes to the Consultation Document or the supporting information. Substantive changes, particularly financial changes, will require amendments to the timetable for consultation and decision making. In this case Council may not meet the statutory deadlines for adoption of the final Annual Plan. 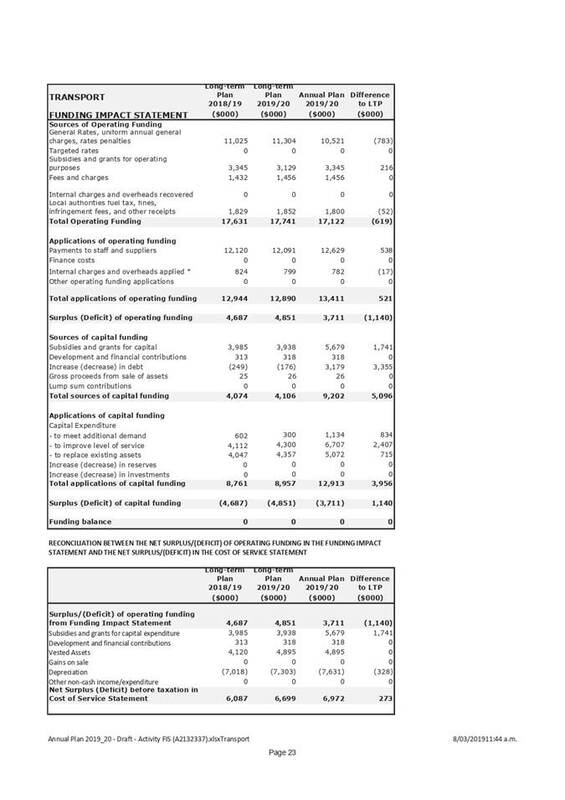 5.2 Option 1 in the table below is the recommended option. · Meets requirements of the LGA. 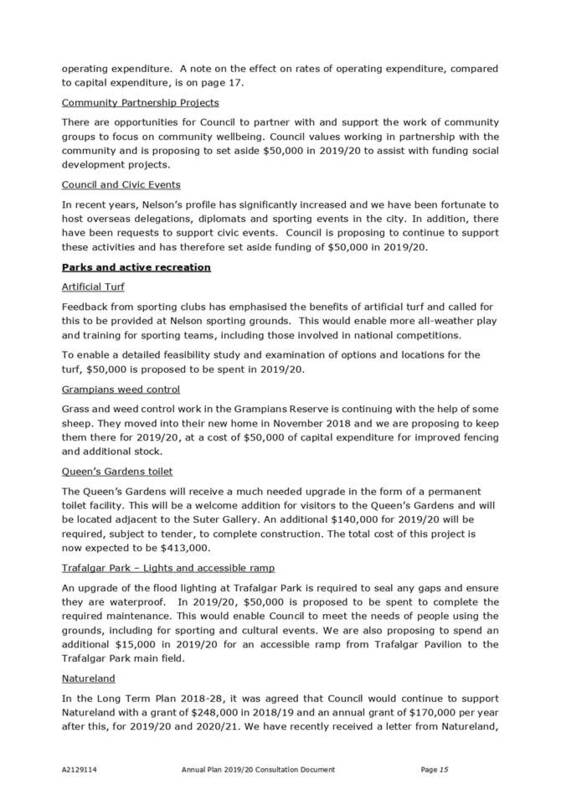 · Community feedback would be sought, and as a result of this feedback changes can be made before the final Annual Plan is adopted by Council. · If Council considers that the supporting information and consultation documents do not meet its needs or the needs of the community, Council can direct officers to make further changes before releasing the documents consultation. 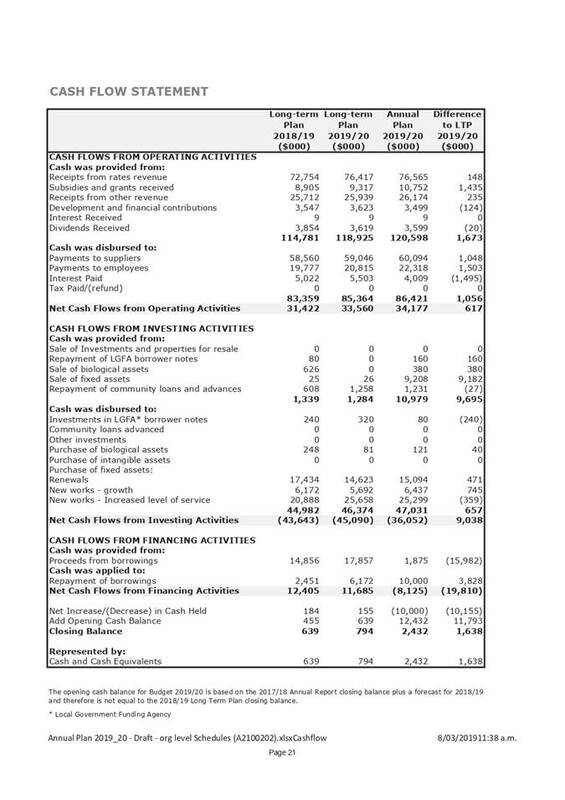 · Financial changes would have an impact on the rates rise and financial information included in the supporting information. 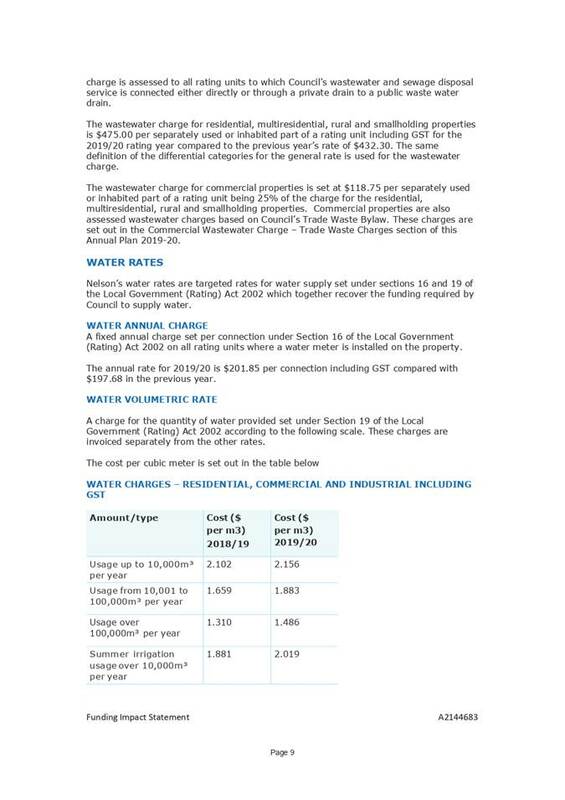 Changes may mean that the rates rise differs from what was indicated in this report. 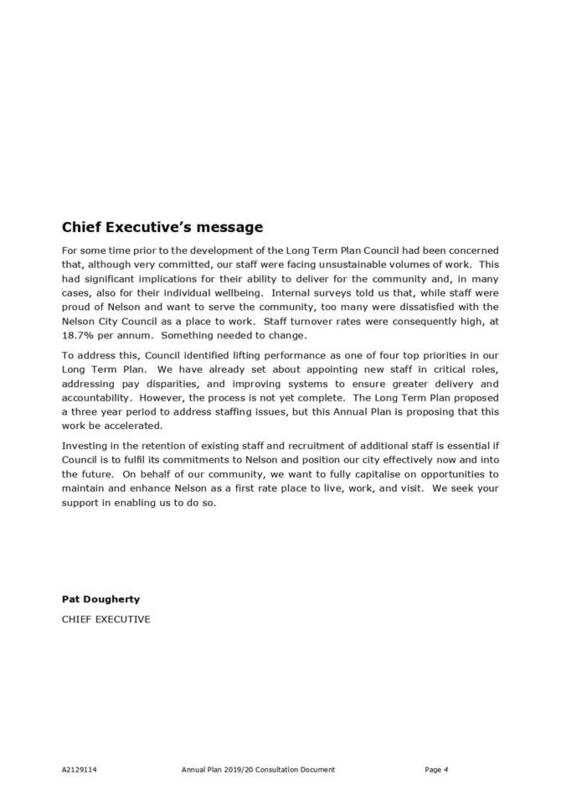 · Substantive changes would cause a delay to the start of consultation and may mean the final Annual Plan could not be adopted by 30 June, as required under the LGA. 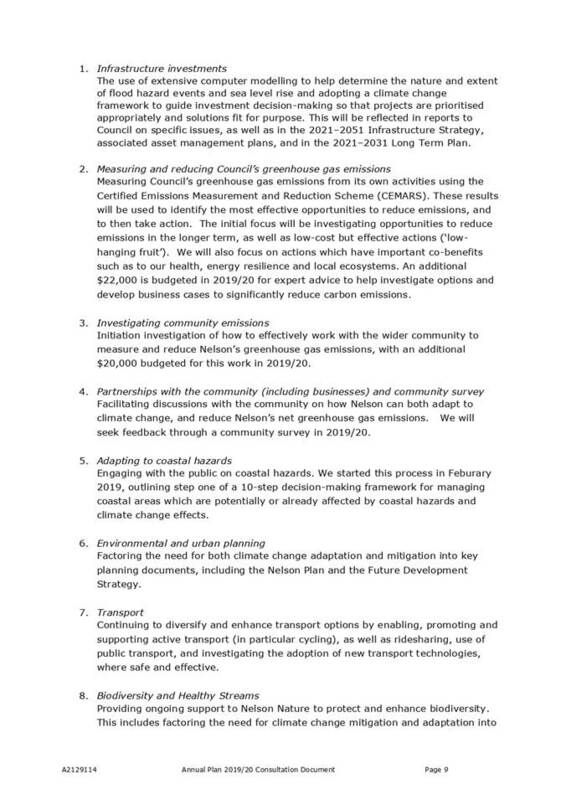 6.1 The supporting information and Consultation Document has been developed following consideration of suggestions made at Council workshops in December and February. 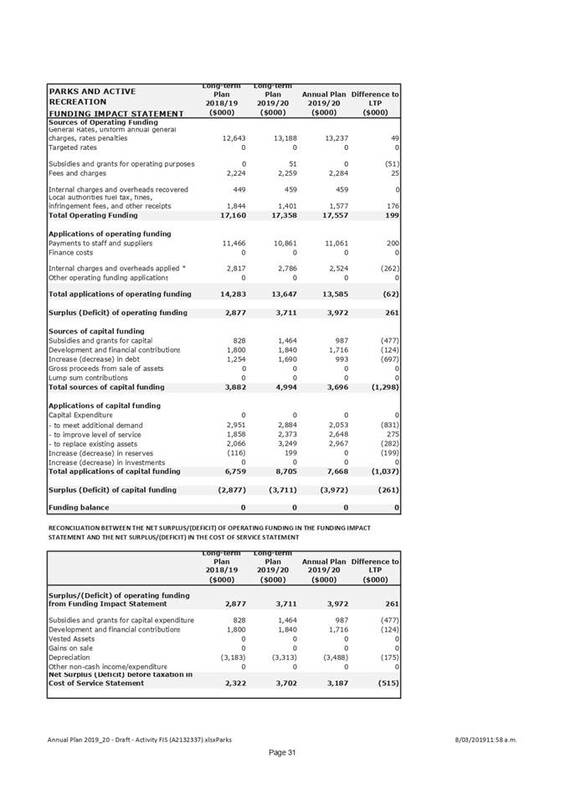 The Mayor and officers also took into consideration the financial prudence requirements contained in Council’s Financial Strategy, requirements of the LGA, and existing decisions from Committees and Council which affect the 2019/20 financial year. 6.2 It is recommended that Council adopts the supporting information for the Consultation Document and adopts in principle the Consultation Document for public consultation. 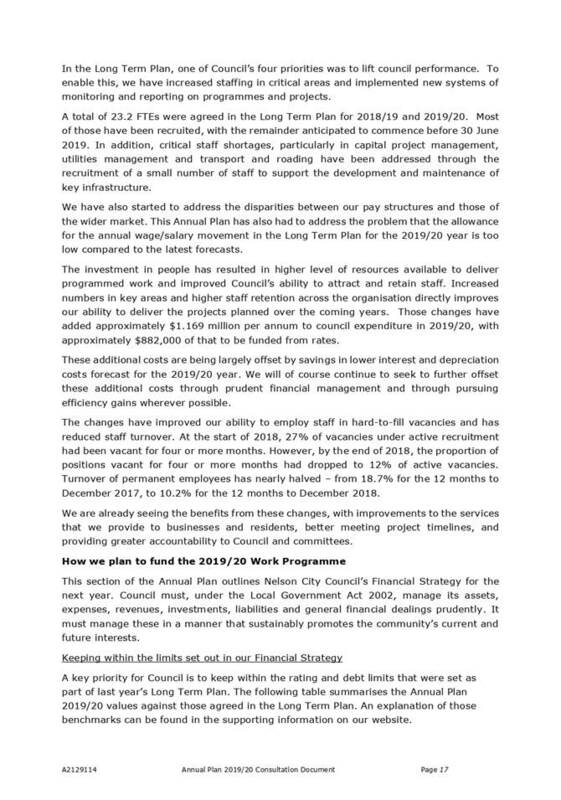 Adopting a Consultation Document that covers proposed changes to the work programme for 2019/20, compared to year two of the Long Term Plan 2018-28, fits with the purpose of local government as it allows the community to provide input on Council’s planned work programme for 2019/20. The proposed changes to Council’s work programme are considered to more appropriately align resources towards achieving the eight community outcomes. 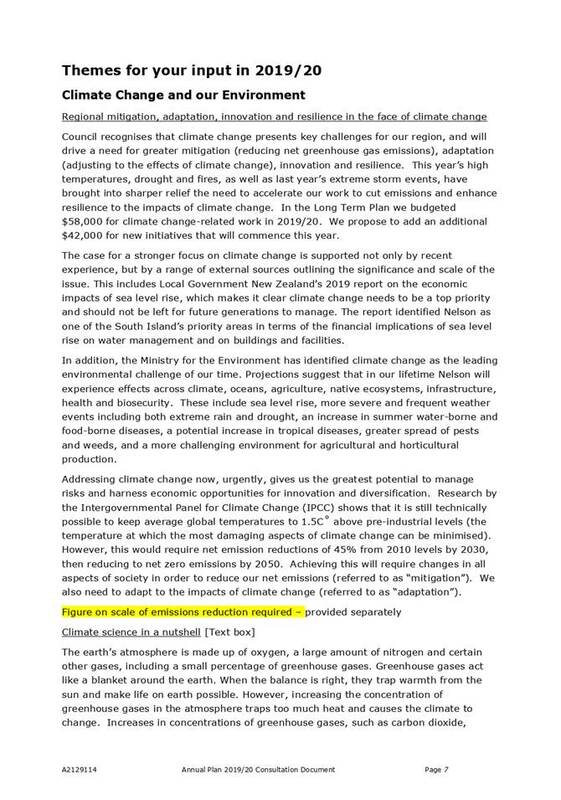 For example the provision of additional funding for climate change and pest management supports the outcome “our unique natural environment is healthy and protected” and additional funding for community partnerships supports the outcome that “our communities are healthy, safe inclusive and resilient”. Adopting the supporting information and adopting the Consultation Document in principle is low risk as undertaking consultation on the proposed changes to the Long Term Plan 2018-28, are in line with the requirements of the LGA. There is a risk that some members of the public might object to the final decisions that Council makes. Ensuring a robust consultation process and explaining the reasons for decisions will help mitigate this risk. 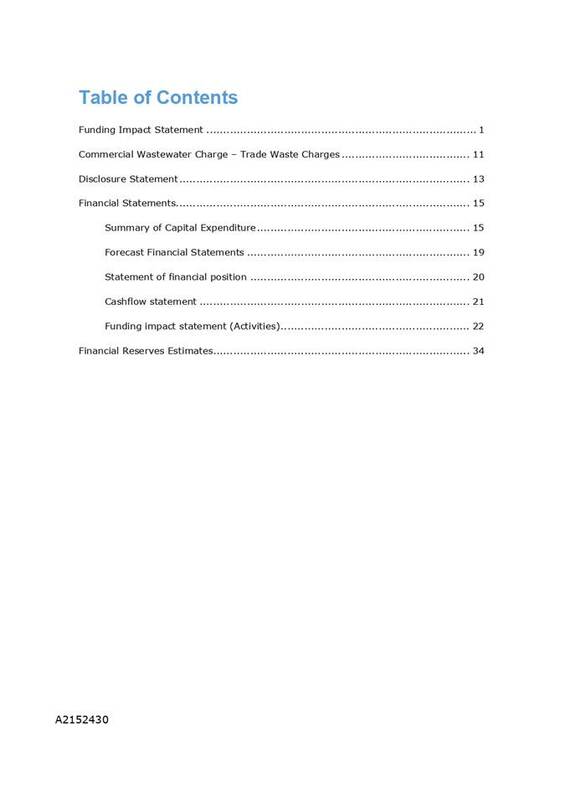 The financial impact of the proposals in the Consultation Document are reflected in the resulting proposed rates change and debt levels. The proposals in the Consultation Document will have varying degrees of significance to different residents and businesses. 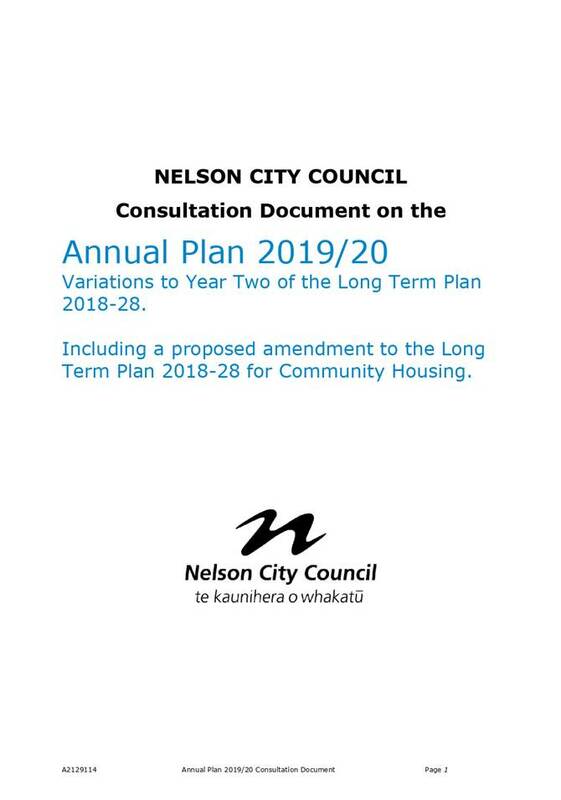 The final Consultation Document is proposed to include an amendment to the Long Term Plan 2018-28 for Community Housing, which requires the use of the special consultative procedure. Officer consider it appropriate to carry out consultation using the special consultative procedure which provides for wide publicity of the Consultation Document, written submissions and hearings. The Council has the responsibility to adopt the Consultation Document and supporting information, and to consult with the public on the proposals which are included in the document. 1.1 To consider and adopt the draft Workshop Policy. 2.1 Council regularly holds workshops for elected members. They are an opportunity for Council management to meet with Council governance outside the decision-making meetings to brief elected members, provide information, explain options, obtain feedback and suggestions. 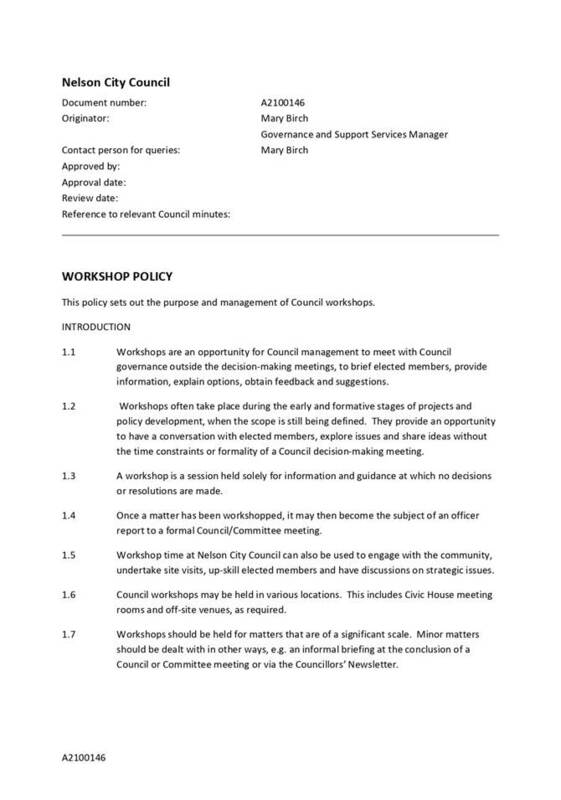 2.2 Council does not have a workshop policy, instead it has been relying on the workshop practices and protocols that have developed over the years. 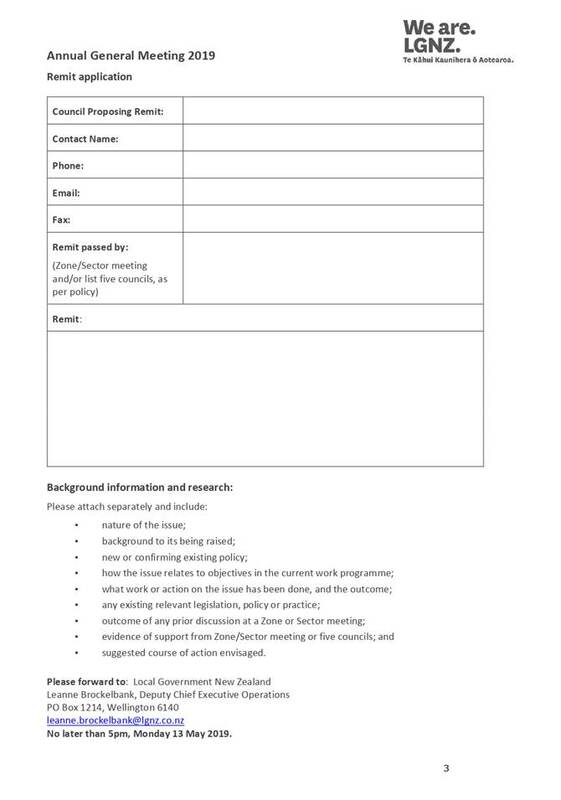 2.3 The purpose of developing a Workshop Policy is to give guidance on all aspects of workshops to provide clarity for members, staff and the public. 4.1 Time is regularly scheduled for Council workshops within the six-weekly meeting cycle. Workshops are held on an “as required” basis at the request of the Chief Executive. Nelson City Council live-streams all its public meetings and public workshops, including public meetings and public workshops held by all committees and sub-committees. 4.3 Through a procedural motion, the matter was left to lie, so that further information could be presented to the elected members prior to making a decision. 4.4 On 20 September 2018, a report on the live-streaming of workshops was presented to Council. In addition to considering the live-streaming of Council meetings and workshops, the report provided information on the status of workshops under the legislation, public access to workshops and local government sector practice. 4.5 The report identified that a policy would ensure that there was a comprehensive and consistent approach on all matters relating to workshops. Requests the development of a Council Workshop Policy. 5.1 In the development of the Policy, officers have considered current Council practice, local government sector best practice, legislative obligations, administrative efficiency and areas identified by elected members, staff and the public as requiring greater clarity. 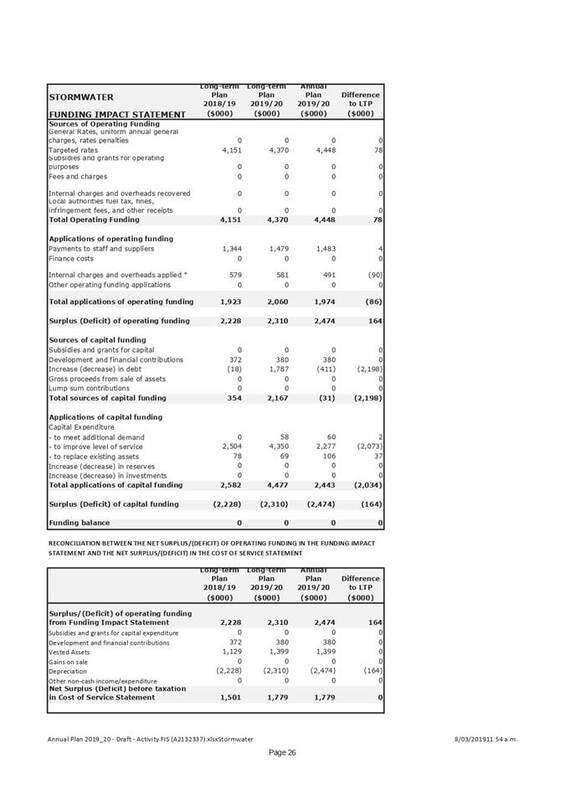 5.2 As the Policy itself is self-explanatory, detailed commentary is not required within this report. However, the following have been highlighted as particular areas where changes to current practice are being recommended or there is a high level of public interest. 5.4 Consequently, public notice of a workshop is not required, Council Standing Orders do not apply and workshops can be either open to the public or confidential. 5.5 Minutes or notes of workshops are also not legally required. However, Council officers take notes during the workshop, if needed. 5.6 The Policy states that workshops should not be used as a mechanism to evade the spirit of legislation by determining issues, making decisions or coming to agreements that are then confirmed without the opportunity for meaningful debate at a formal decision-making Council/Committee meeting. 5.7 In accordance with current practice, public access is provided to all open workshops. 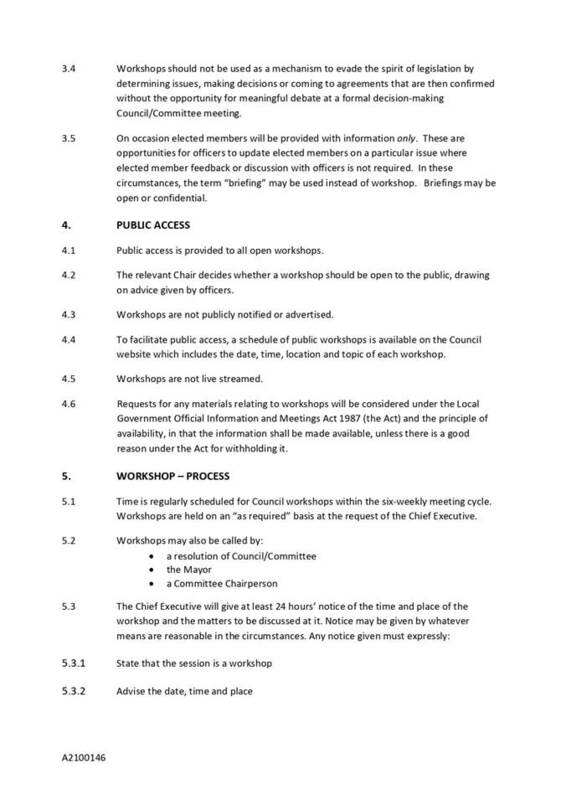 The Chair decides whether a workshop should be open to the public, drawing on advice given by officers. 5.8 As workshops are not publicly notified or advertised, to facilitate public access, officers recommend that a schedule of public workshops is made available on the Council website. 5.9 Requests for any materials relating to workshops are already considered under the Local Government Official Information and Meetings Act 1987 (the Act) and the principle of availability, in that the information shall be made available, unless there is a good reason under the Act for withholding it. 5.10 Live-streaming of workshops was considered in detail at the Council meeting on 20 September 2018 when the motion to live-stream all workshops was lost. The Policy reflects this. 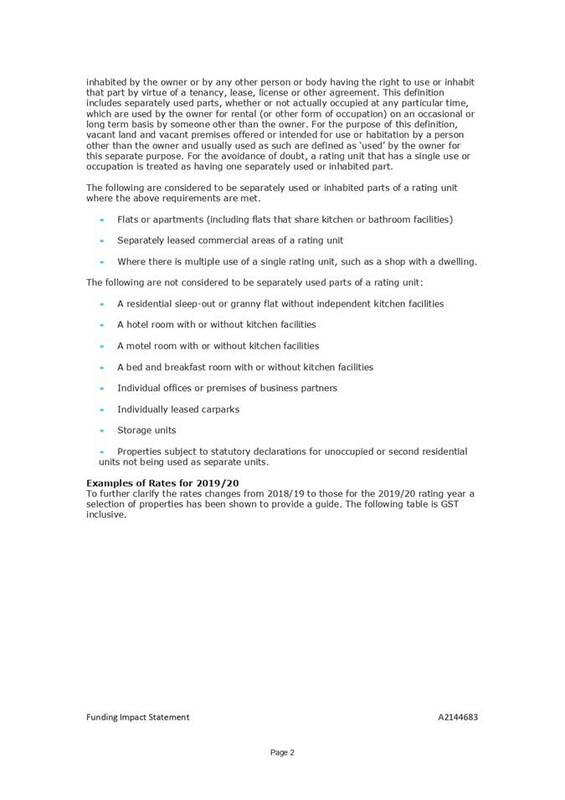 5.11 The Policy provides clarity on the responsibilities of the Chair. 6.1 Option 1 is recommended. 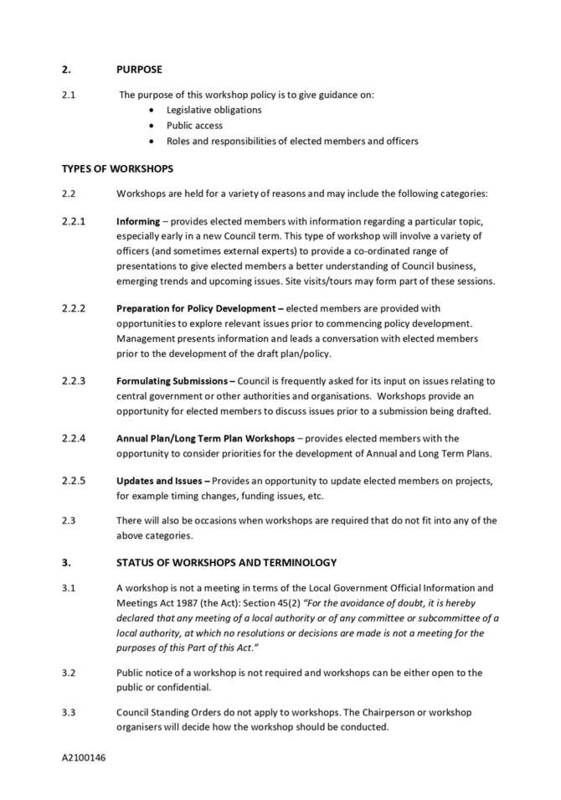 7.1 A Council Workshop Policy, provides clarity to the public, the organisation and elected members and ensures that a consistent approach is taken regarding all matters relating to workshops. 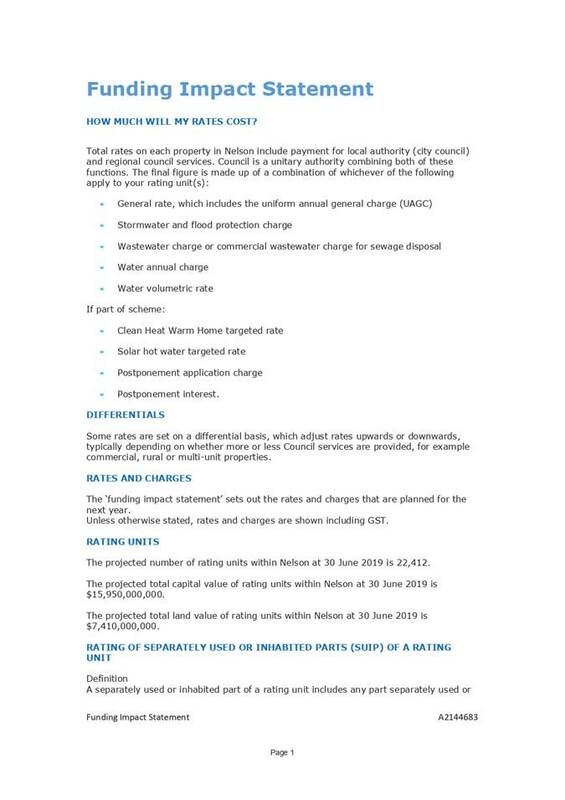 A consistent approach to all matters relating to workshops and the information made available to elected members supports transparency of decision making and accountability of council to the community. “Our Council provides leadership and fosters partnerships, a regional perspective, and community engagement”. There is a risk that members of the public are dissatisfied with some aspects of the Council Workshop Policy. 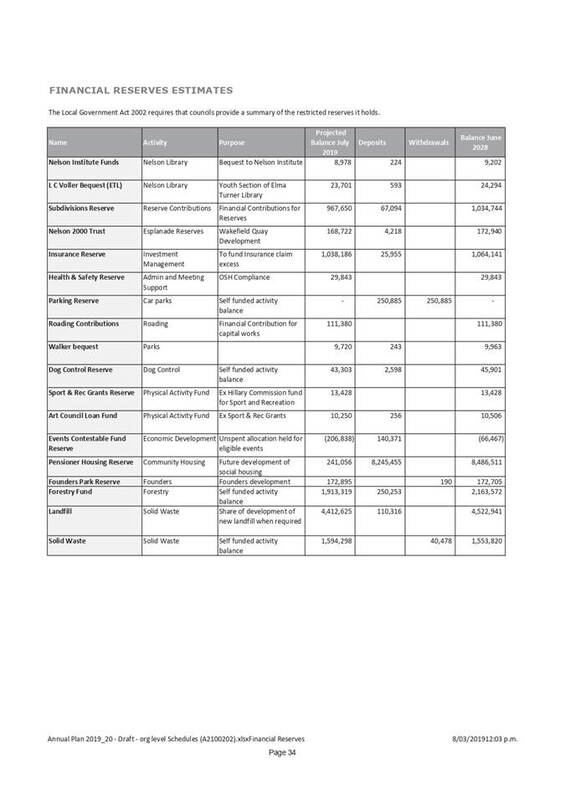 There is no financial impact associated with the development of a Council Workshop Policy. Whilst matters concerning public access to workshops and the information provided to elected members have generated a high level of public interest from a few members of the community, it is considered that the decision whether to adopt the Policy is of low significance in terms of the Council’s Significance and Engagement Policy. No additional public consultation or engagement is required. This is a decision for Council.